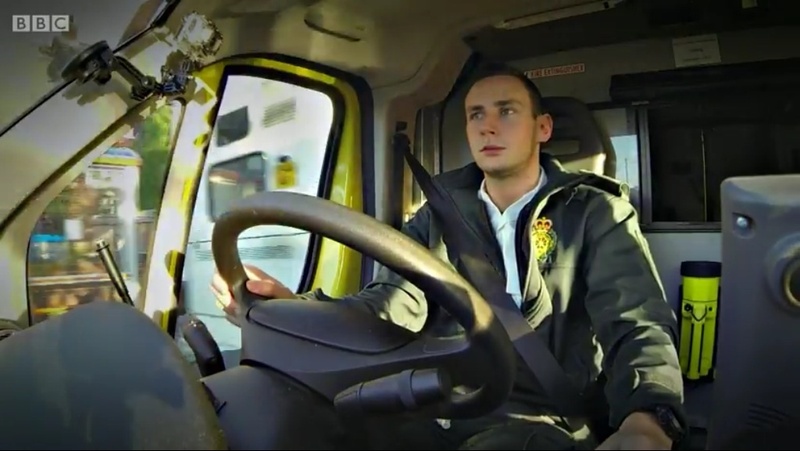 In the final episode of First Time on the Frontline we meet up again with rookie paramedics Sam and his good friend Ben. 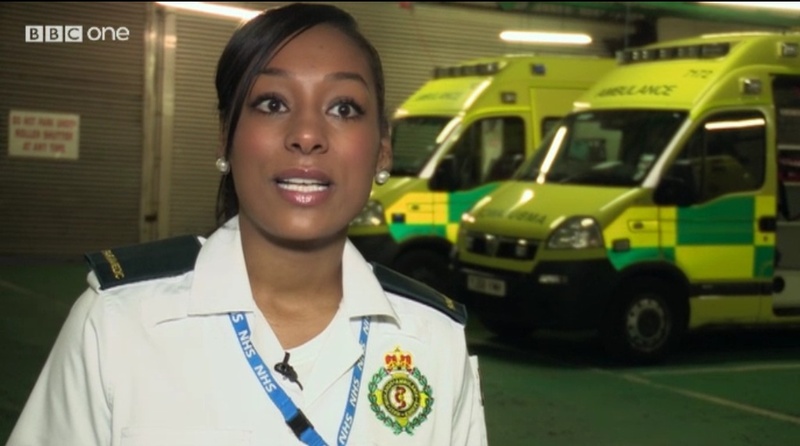 We see how far they have come in the three months since they joined West Midlands Ambulance Service. Sam has to show his adaptability when it comes to directing the firefighters who have come to help extricate a young woman from a car crash. Next up a tragic case of an 88 year old lady who has had a stroke. Despite getting there quickly and everything possible being done, unfortunately she dies a short time later. Talking about coping with bereavement, Sam says: ” As long as I feel I was able to provide my patient with the best level of care that I could, then I am happy. You have to find your own coping mechanism – it is the nature of the job at the end of the day. 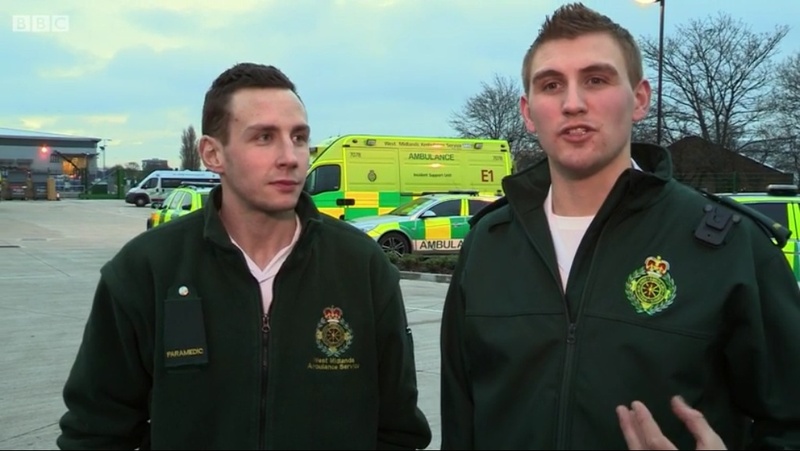 Finally, Sam and Ben pair up to help a man who has been involved in a collision with a car. They have to work fast but carefully due to the freezing conditions and the concern that he might have a ncek injury that could potentially leave him paralysed. Finally a chance to reflect on their three months in the job. Both agree it’s a great job and so much more. Friday 16th May 2014 – 11.55am – Chris Kowalik. A van was on its side but it’s trapped driver was standing up in it following a collision in Birmingham. West Midlands Ambulance Service received a call at 7.59am today to go to Wolverhampton Road South in Quinton. A paramedic area support officer in a rapid response vehicle and an ambulance crew attended. A West Midlands Ambulance Service spokesman said: “A VW Caddy had collided with a lorry and landed on its side. Its driver, a man in his thirties, was standing up in it but couldn’t get out. The driver of another van initially helped keep the scene clear for the emergency services by blocking the road to other traffic. Thursday 15th May 2014 – 5.30pm – John Hawker. A man suspected of taking a drugs overdose has been arrested after lashing out at paramedics trying to help him and then driving off in their ambulance. 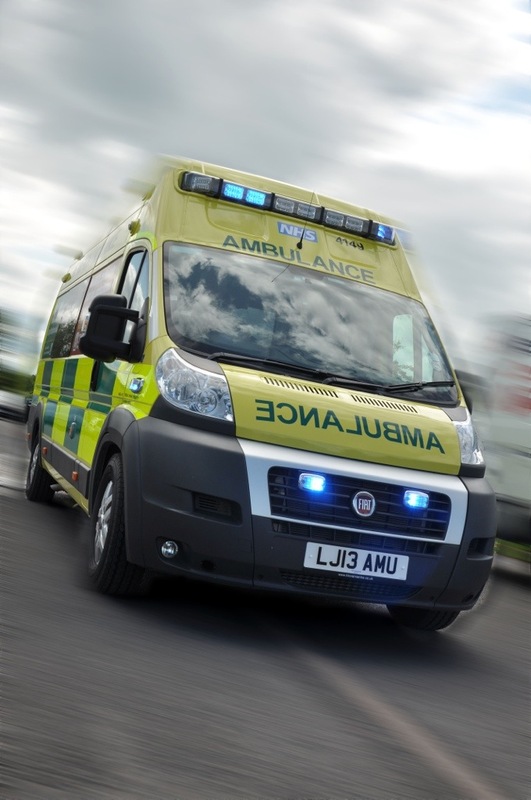 Police were alerted to a patient acting violently towards an ambulance crew who’d attended a call-out to a flat in Bloxwich High Street just before 3pm today (May 15). It’s understood the 37-year-old assaulted two male staff members before forcing them out of the ambulance in Green Lane – near the junction with Newfield Close – before jumping behind the wheel and driving off. The ambulance was driven erratically in Green Lane, making at least two U-turns, before being forced to stop near Green Lane Baptist Church by a police response vehicle. A man from High Street, Bloxwich, was arrested at the scene on suspicion of assault and vehicle theft and is being held at a police station. West Midlands Police Inspector Tony Banton, from Bloxwich Police Station, said: “The ambulance was driven off with its rear doors still open…it was reported being driven very erratically and we’re looking into whether it may have struck other vehicles. “A response vehicle quickly picked up the ambulance and the man was arrested within five minutes of the emergency call coming in to us. Two male members of ambulance staff were also taken to hospital as a precaution but are not seriously injured. 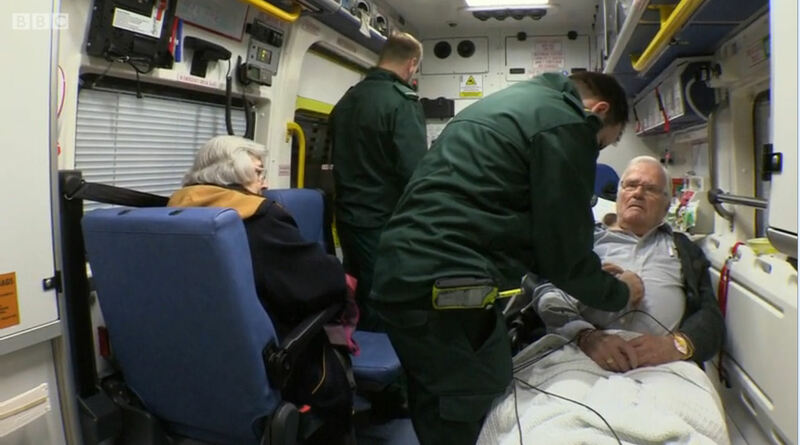 A spokesperson for West Midlands Ambulance Service, said: “Two ambulance crew members were attacked by a man they’d been called to help and who they believed needed hospital treatment – for them to be attacked is disgraceful. “Thankfully they’ve not been seriously hurt but no doubt this was a shocking, unexpected incident, plus one of our vehicles has been badly damaged and will have to be taken off the road for some time to be repaired. Thursday 15th May 2014 – 3.15pm – Claire Brown. A charity cycle ride by a group of paramedics last week saw them peddle a gruelling 850 miles from John O’Groats to Land’s End in just seven days. Black Country paramedics Dave Bentley and Neil Weaver together with a support crew of paramedics Neil Baars and Olly Ayles, embarked on their journey on Saturday 3rd May in a hope to raise £2,000 for Pilgrim Bandits, a charity which supports injured armed forces members. 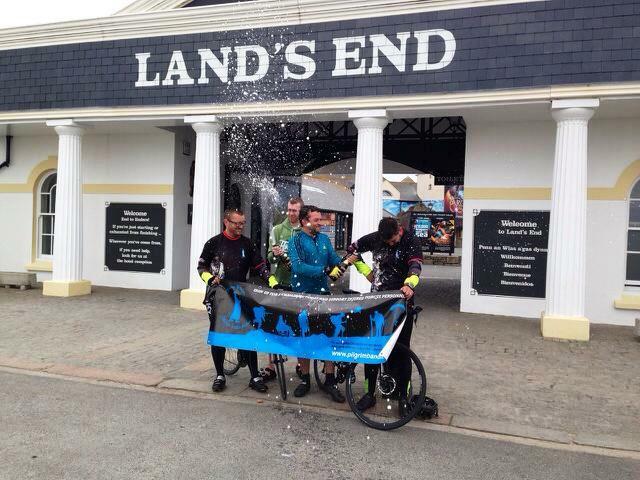 On Friday 9th and after seven tough days of cycling, the team declared to their avid Facebook and Twitter followers that the “boys have arrived” in Land’s End where they celebrated their achievement with a bottle of champagne. The journey, however, wasn’t without incident. On day two, Neil came off his bike on the A9 in Scotland and was knocked unconscious. 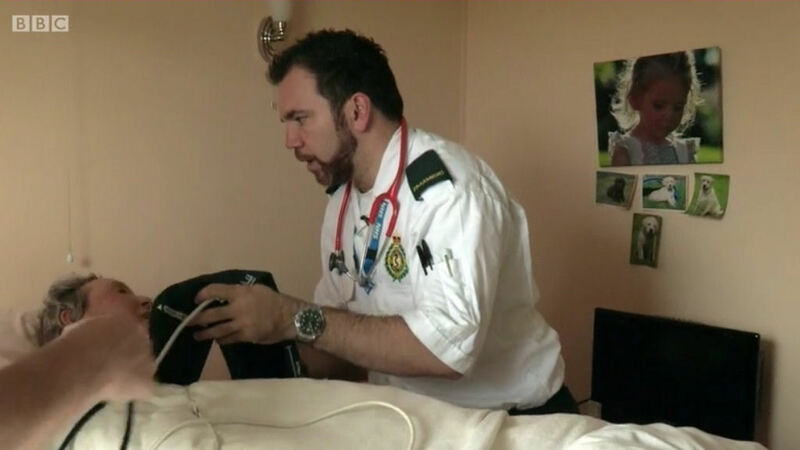 He was given treatment by the paramedic support crew and colleagues from the Scottish Ambulance Service. After a few days rest and recuperation, Neil returned to the saddle. During day five, a combination of poor weather, punctures, navigational problems and sheer exhaustion meant the team had to abandon the day’s planned journey early in North Devon. 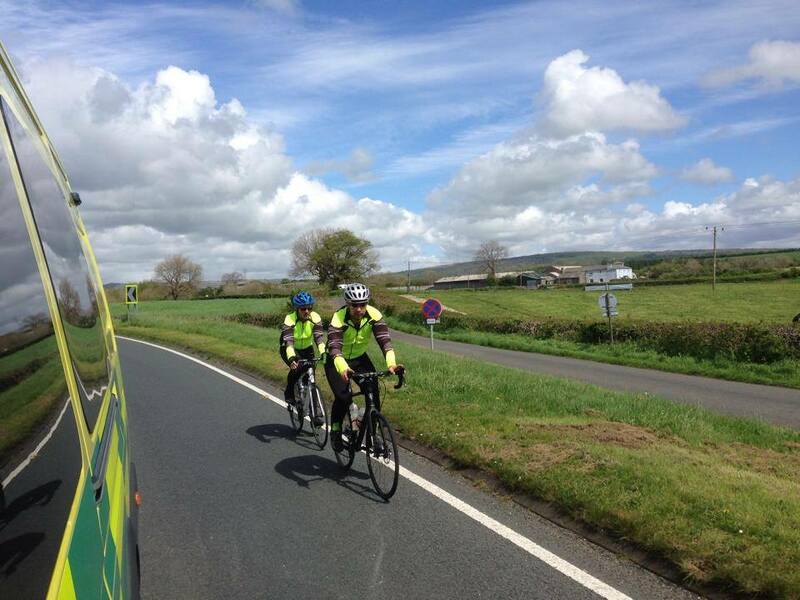 On day seven and with less than 50 miles to go, the team got off their bikes to help an elderly couple at the side of the road. In full cycle gear, Dave, Neil and Olly changed a flat tyre on their car. The couple were so grateful that they donated £20 to Pilgrim Bandits. 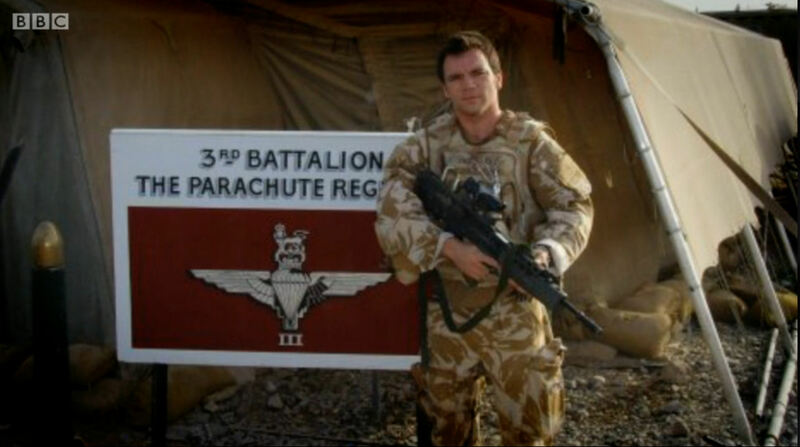 Dave, whose close friend was severely injured during a tour of Afghanistan in 2006, said: “It was a hard and exciting week with lots of ups and downs….. and that was without the hills! Seeing my mate injured on day two, I feared that we would have to cut short the event. However, with his bravery for getting back on the bike, the support teams’ massive efforts and the huge support we received from people along the way, we were strong into the finish. Not only have we smashed our target by raising £2,800 for Pilgrim Bandits, we’ve raised awareness about the charity along the way. A massive thanks to all who have supported the event. We’re still recovering!” To read about their incredible journey and to see more photographs, visit their Facebook page via https://www.facebook.com/999jogle2014. Her next case is to Christine who has fallen whilst running for a train. Judging by the swelling to her leg, it looks like she might have fractured it. 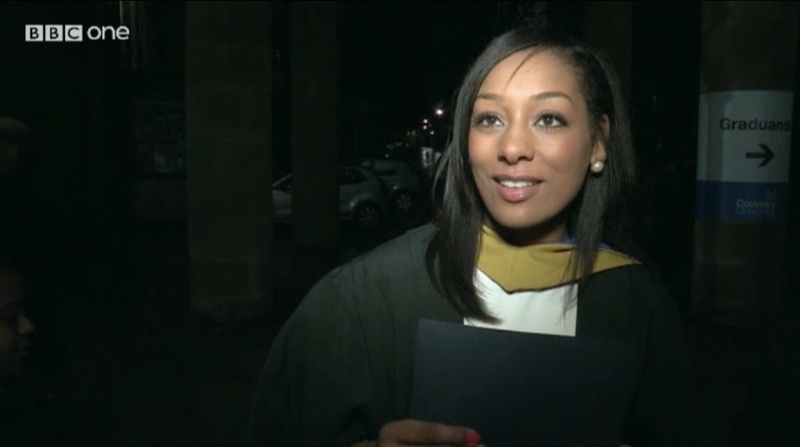 For Maya, she is growing in confidence but is well aware that it is only a matter of weeks since she left university. For all that, it’s clear that she loves her job and patients are benefitting from that. Thursday 15th May 2014 – 7.30am – Jamie Arrowsmith. 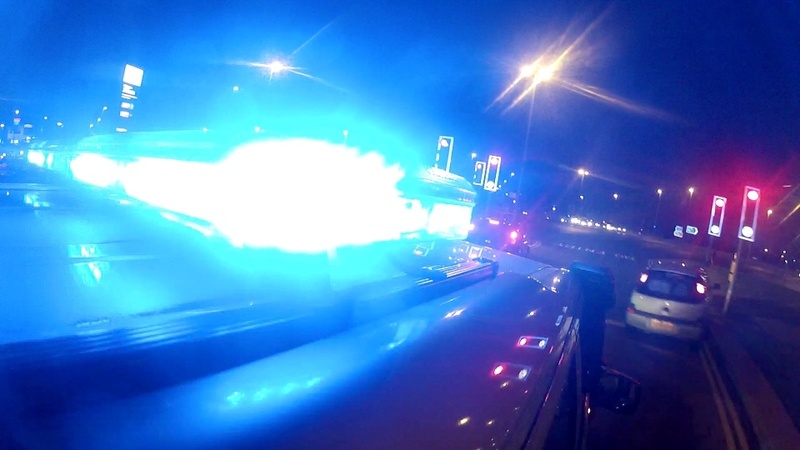 A motorcyclist had to be airlifted to one of the region’s major trauma centres following a road traffic collision with a car in Burton last night (Wednesday). West Midlands Ambulance Service was called to the incident in Ashby Road, Winshill shortly after 7.20pm and sent an ambulance and the Midlands Air Ambulance from Staffordshire to the scene. The police were also in attendance. 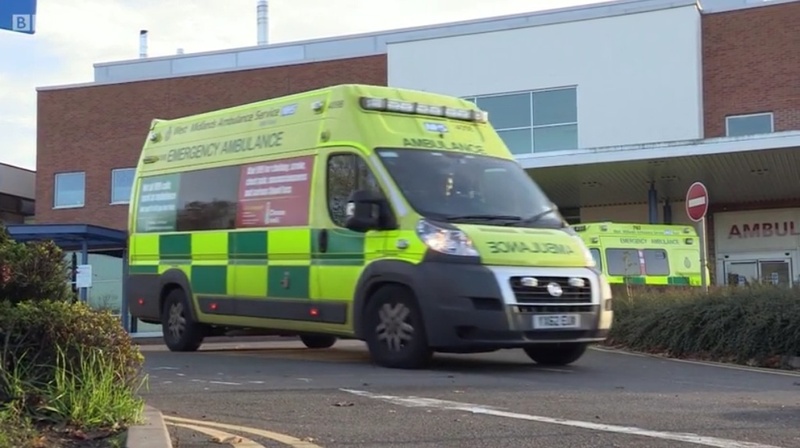 A West Midlands Ambulance Service spokesman said: “On arrival, crews found a man lying injured away from his motorbike and a car that had suffered damage. “The motorcyclist, a man believed to be in his 40s, had suffered several injuries including a right wrist fracture, a suspected right elbow fracture and a groin injury. “Crews worked quickly to assess the man and begin treating him. 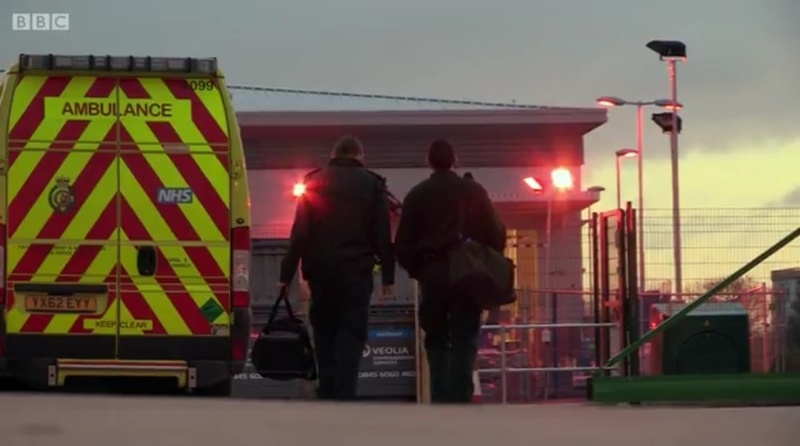 He was also given pain relief before being airlifted to University Hospital North Staffordshire. The hospital was alerted to the man’s condition prior to his arrival. Those are the words of rookie paramedic Sam, one month into his new career. For the 22 year old, the shift will bring some challenges. First up is a 28 year old mum who has a ulcer. Sam has to keep her baby son happy so that it doesn’t affect her blood pressure. Then it’s on to help a mum to be Nicola. SHe’s nine months pregnant and due to have a Caesarian in two days time when her waters break. Can Sam get her to hospital before her baby decides to make his first appearance? 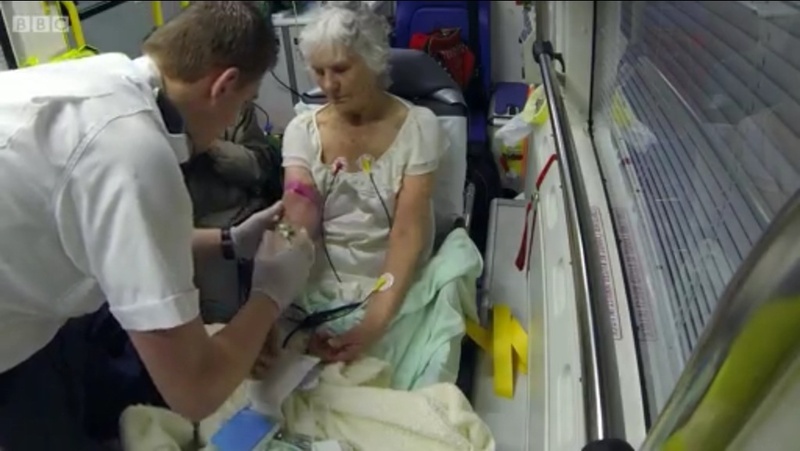 Catch up with First Time on the Frontline – Episode 13 here. 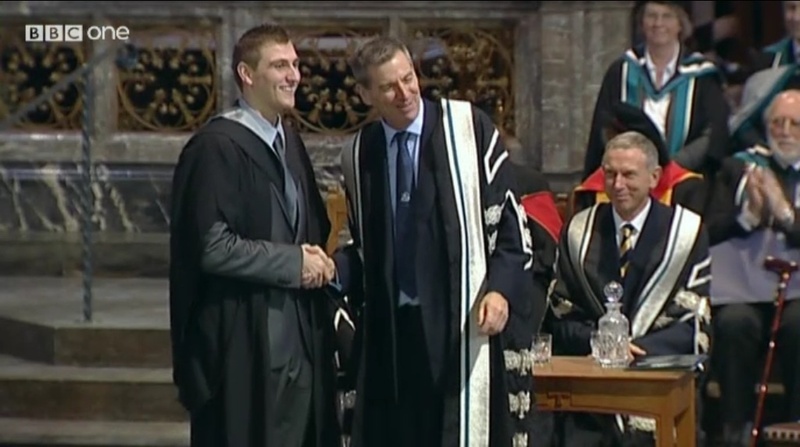 Wednesday 14th May 2014 – 4.35pm – Chris Kowalik. Her Royal Highness, Anne, Princess Royal has presented a Community First Responder from north Shropshire with his MBE at Buckingham Palace. John Roberts from Oswestry was named in the New Year’s Honours for his charity work, including his efforts with the Community First Responders in Shropshire and services to athletics, having been involved in the sport since the mid-1980s. 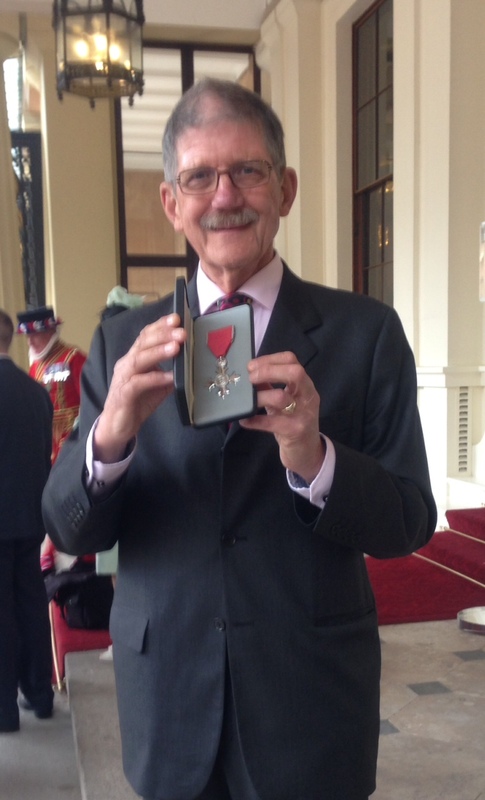 He was presented with the honour on Thursday 1st May. John said: “It was a fantastic day, apart from the weather! I met some stars including the England women’s rugby captain, the women’s soccer captain and other people. Wednesday 14th May 2014 – 4.20pm – Chris Kowalik. 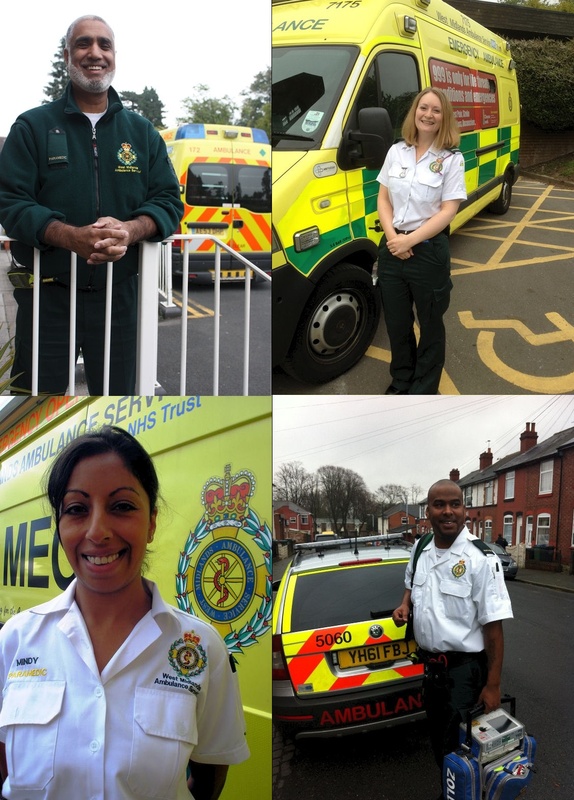 Three members of West Midlands Ambulance Service staff based in Worcester are to take part in the city’s 10k race. Emergency Medical Technician Nicky Masters and paramedics Lisa Medhurst and Andy Lightbody will be running in the Worcester City 10k race on Sunday 1st June. For Nicky it will be the first such run. She will be raising money for Midlands Air Ambulance. 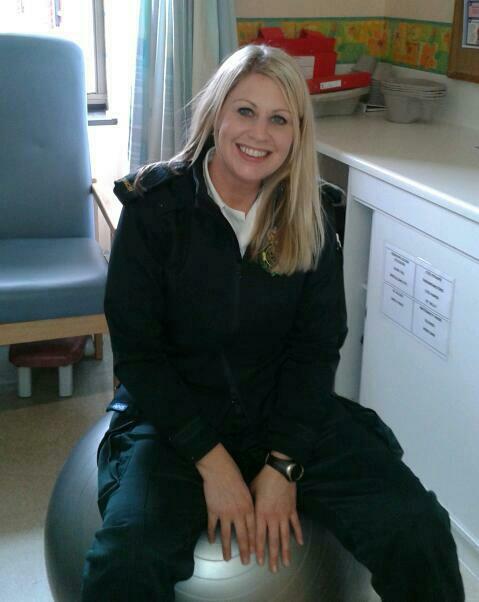 She will be joined by her current ambulance crewmate Andy. Wednesday 14th May 2014 – 4pm – Chris Kowalik. It will hurt. Be very generous. Those are the words of the JustGiving fundraising page for a team of doctors and nurses who are going to run up and down Mount Snowdon (12 miles) and cycle the 28 miles around the Snowdon’s base, taking in a canoe trip around Llyn (Lake) Gwynant on the way. The entire venture is known as “Snowdon Extreme”. 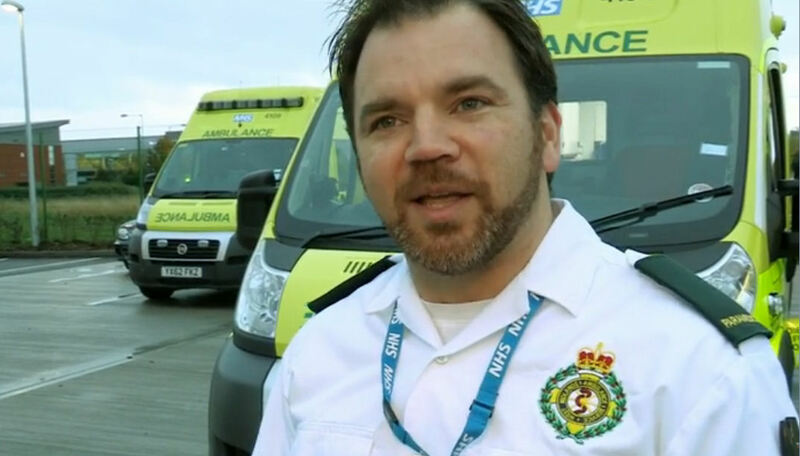 The team includes Nick Crombie, a BASICS Emergency Doctor who responds to medical emergencies for West Midlands Ambulance Service and Midlands Air Ambulance and who is also Clinical Service Lead in Anaesthesia at Queen Elizabeth Hospital Birmingham. A man sadly died during a road traffic collision in Bromsgrove last night (Tuesday). West Midlands Ambulance Service was called to the junction of the A38 and New Road at 10.20pm. An ambulance, a paramedic support officer and a MERIT doctor were sent to the scene. The police were also in attendance. A West Midlands Ambulance Service spokesman said: “Crews arrived to find a car that had been in collision with a pedestrian. “The pedestrian had suffered severe head injuries and advanced life support was carried out at the scene by medics. “Unfortunately, despite the best efforts of all clinicians, nothing could be done to save him and he was confirmed dead at the scene. 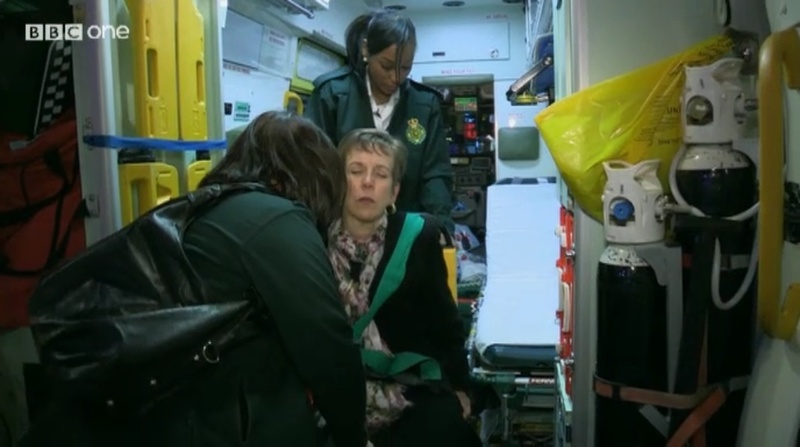 In today’s Episode of First Time on the Frontline, we see Julie treating two patients. The first is 53 year old epileptic Neil who is in severe pain after a fall. 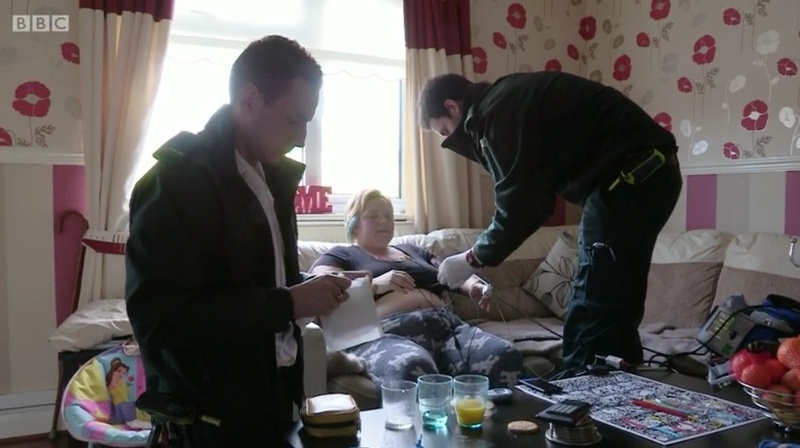 Julie has to think laterally to ensure he gets the necessary pain relief and asks for back up from the HART Team. Her second patient is Ethel who at 68 is once again battling cancer and has got suspected pneumonia which could potentially kill her. Julie has to act fast to make sure both her patients get the care that they need. Tuesday 13th May 2014 – 12.10pm – Claire Brown. 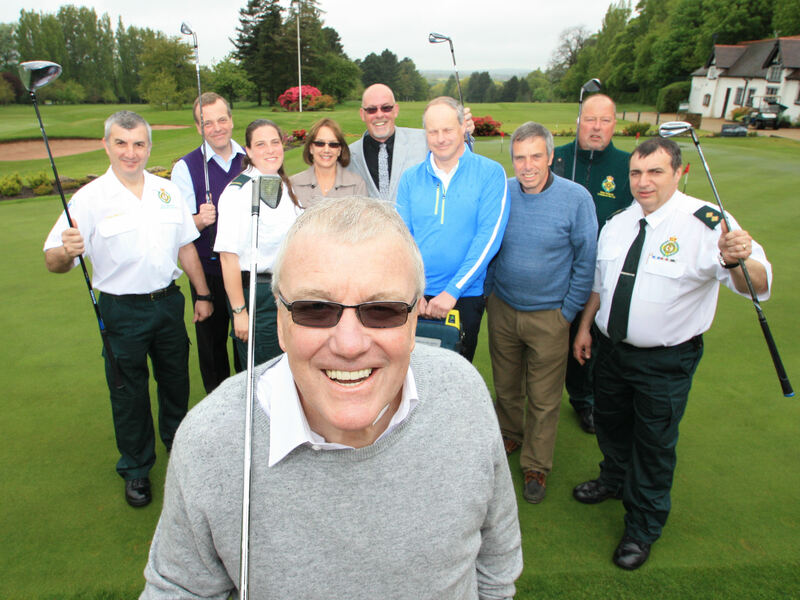 A golfer who collapsed on the 6th tee at South Staffordshire Golf Club in Wolverhampton was reunited with his life savers last week. Former Wolverhampton Wanderers director, 64 year old Kevin Threlfall from Perton, was playing in a golf competition at the club on April 24th when he suffered a cardiac arrest. Whilst Steve and Martin did CPR, Golf Club Official Ian Guest raced to the club house to fetch their automated external defibrillator (AED) which had never been used before. Two ambulances, two paramedics and the Midlands Air Ambulance from Cosford with a MERIT trauma doctor on board rushed to the golf club. Wolverhampton based Advanced Paramedic Andy Watson, 49 from Perton, was first on scene within six minutes and said: “All in all, we worked on Kevin for about 45 minutes on the tee. He had a total of nine defibrillator shocks and various other emergency interventions before we managed to get some respiratory effort from Kevin. If Steve and Martin hadn’t of started CPR when they did, we wouldn’t have had such a fantastic outcome. Though breathing, Kevin was in a critical condition. En route to New Cross Hospital ambulance staff battled to keep him alive. Gill and the family were told to expect the worst by doctors at hospital. Kevin was on critical care for several days and after having surgery to fit an internal defibrillator, he was discharged from hospital and is recovering well at home. 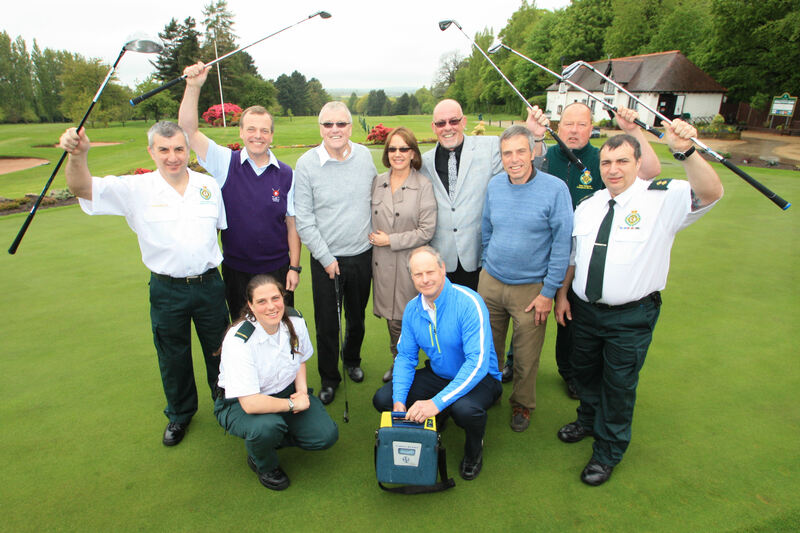 Pictured left to right: Andy Watson (Advanced Paramedic), Martin Knowles (fellow golfer who did CPR), Liz Gurney (Paramedic), Kevin and Gill Threlfall, Steve Woodward (fellow golfer who did CPR), Ian Guest (Golf Club Official with defib), John Mumford (Kevin’s team mate), Rob Felton (Emergency Medical Technician) and Simon Chambers (Paramedic Area Support officer). 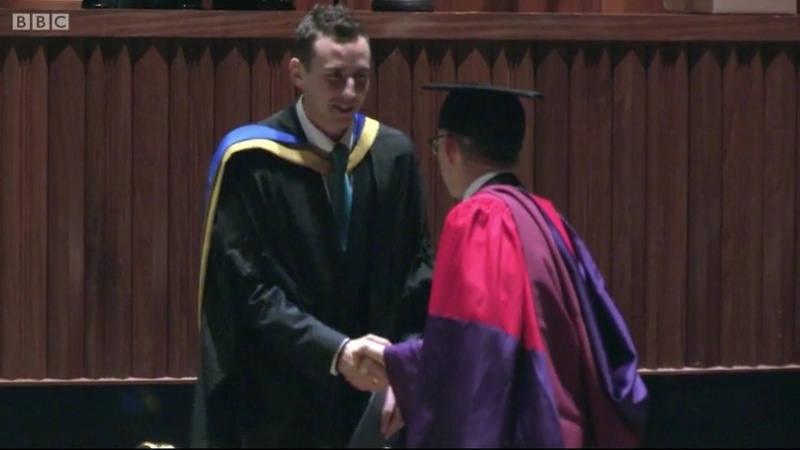 Monday 12th May 2014 – 11.55pm – Murray MacGregor. Two teenage girls have been taken to hospital after they were struck by a car in the Upper Gornal area of Dudley. The collision happened in Valley Road at just after 10.00pm on Monday evening. Two ambulances and a paramedic officer were sent to the scene after no fewer than six 999 calls about the incident. A West Midlands Ambulance Service spokesman said: “On arrival, crews found a red Vauxhall Corsa with a badly damaged front wheel. “The teenage girls were sitting on the pavement with a large number of local people at the scene. 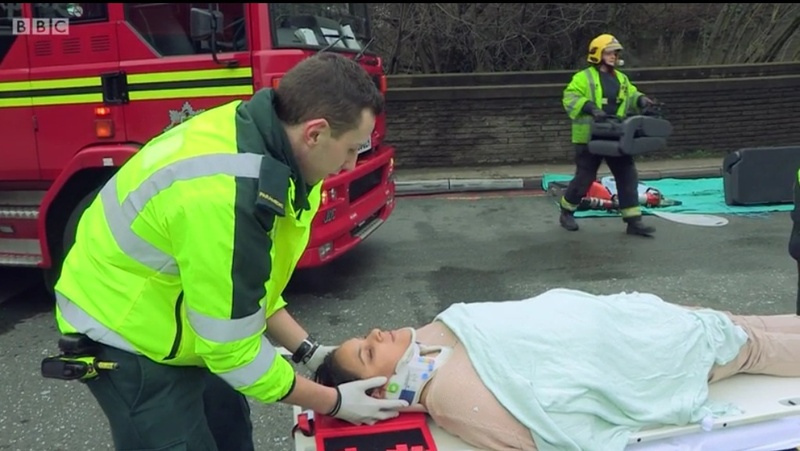 “A 14 year old girl was taken to Russells Hall Hospital with suspected fracture to her ankle. 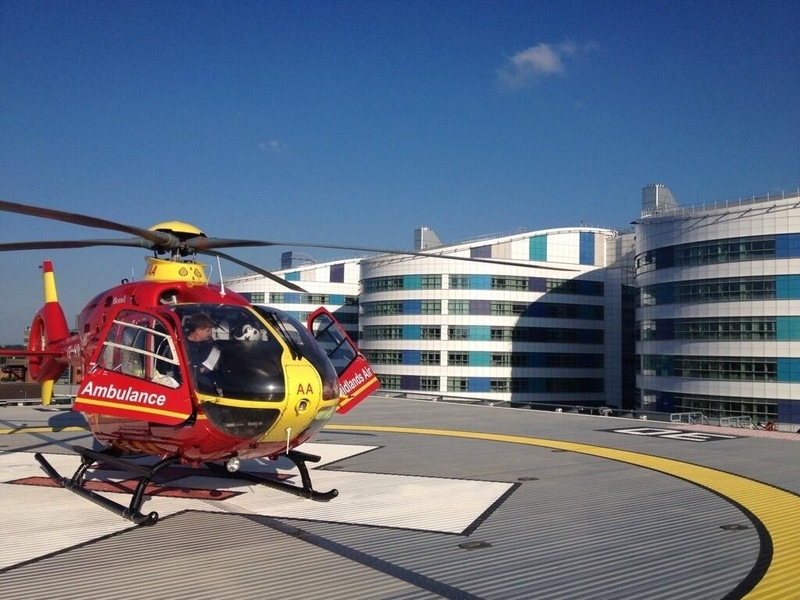 “A 13 year old was taken to Birmingham Children’s Hospital with a potentially serious hip injury. Ambulance staff immobilised the girl and also put a pelvic binder in place. Monday 12nd May 2014 – 11.35pm – Murray MacGregor. A pedestrian has suffered a potentially serious head injury after a collision with a car in Dudley. The crash happened on Queens Cross near the Cemetery at 9.20pm on Monday evening. Witnesses told ambulance staff that a man, in his mid 30s, had collided with the car leaving damage to the bumper and a ‘bullseye’ on the windscreen. 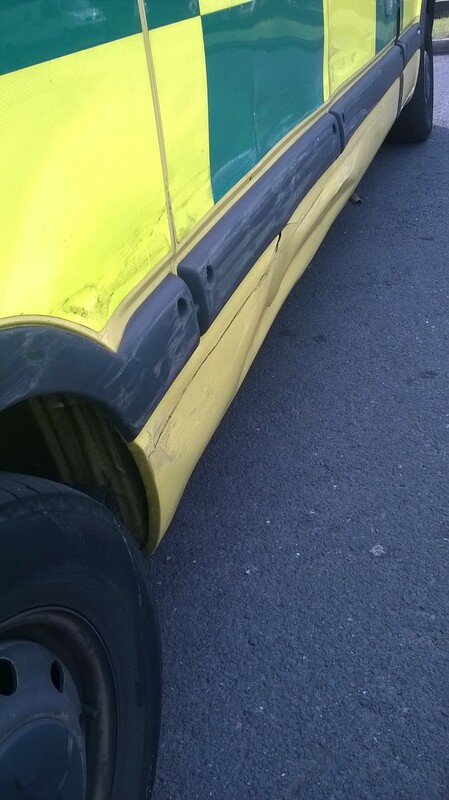 An ambulance that was taking a patient to Russells Hall Hospital came across the collision and provided aid until a further ambulance, a rapid response vehicle, a paramedic officer and the MERIT trauma doctor arrived at the scene. A West Midlands Ambulance Service spokesman said: “The man was initially unconscious but started to come round as he was treated. The doctor prepared the patient for anaesthesia, but in the end that was not required. 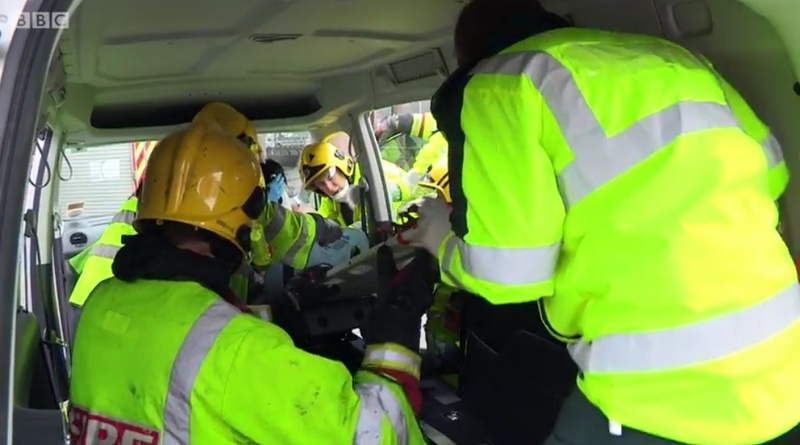 He was immobilised using a specialist stretcher and head blocks before being taken on blue lights to the major trauma centre at the Queen Elizabeth Hospital Birmingham with the doctor travelling with the ambulance crew. “The doctor reported that the man’s condition was stable and the initial work at the hospital showed that his injuries did not appear as serious as might have been expected. “The woman driving the car was uninjured. “The Trust would like to thank a member of the public who stopped at the scene to provide assistance. The first crew on scene were very grateful for his help.” We have no details about this individual. Monday 12th May 2014 – 6.50pm – Murray MacGregor. 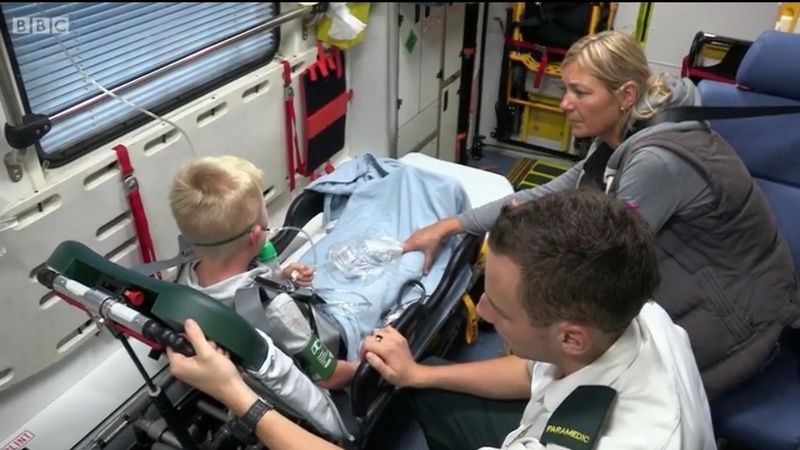 A teenager has been airlifted to a major trauma centre after suffering a nasty leg break after slipping over in the playground. The incident took place at Fair Oakes College in Penkridge Bank Road in Rugeley. An ambulance, a rapid response car and the Midlands Air Ambulance from Staffordshire were sent to the scene after an emergency call at 1.15pm on Monday. A West Midlands Ambulance Service spokesman said: “On arrival, crews found a 13 year old boy who had fallen in the wet outside. “The aircrew were able to give him advanced pain relief so that he could have his right leg manipulated and then be put in a splint. Monday 12th May 2014 – 6.10pm – Murray MacGregor. A man has been taken to a major trauma centre with serious chest injuries after falling over 30 feet from scaffolding. The incident took place at a warehouse off Mornington Road in Smethwick at about 4.15pm on Monday afternoon. A rapid response vehicle, an ambulance, A BASICS Emergency Doctor and the Midlands Air Ambulance from Cosford with the MERIT trauma doctor on board were sent to the scene. A West Midlands Ambulance Service spokesman said: “On arrival, crews found a man who finding it hard to breathe after falling from the scaffolding and landing on the concrete below. They were told that he had landed on his right arm and chest. “The man, who was in his 60s, was fully conscious throughout but had suffered a significant chest injury. After being given pain relief, he was immobilised using a neck collar and spinal board. 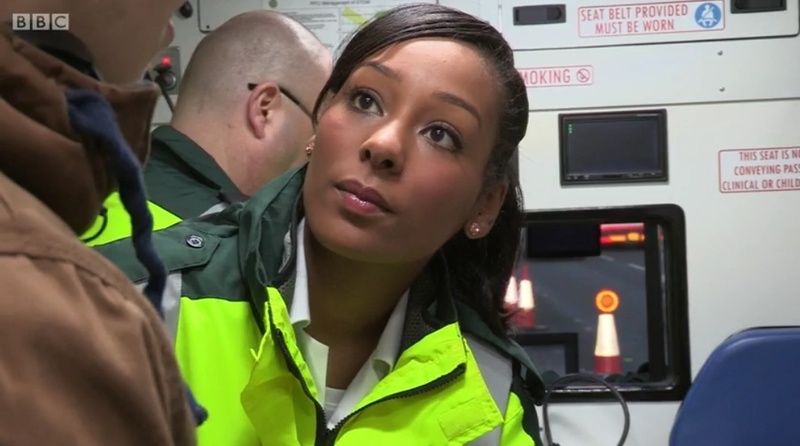 Are you nervously waiting to see how your application to become a student paramedic went? 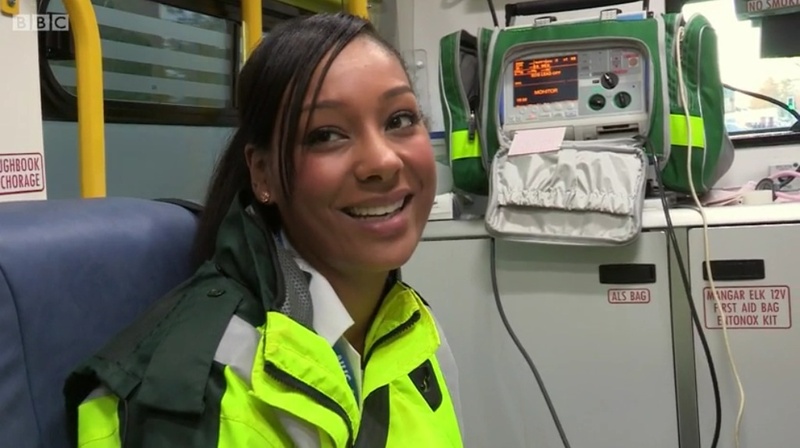 We know that literally hundreds of people recently applied to become one of our student paramedics and you are probably desperate to know if you have been shortlisted. If that’s you, firstly, thank you for taking the time to apply. As you can imagine, we’ve had a few queries about the situation. Our Recruitment team say they are still going through the shortlisting process at the moment but as soon as this is complete the team will be in contact with each applicant via NHS Jobs. With this in mind they are advising that individuals check their NHS Jobs account over the next few days for any updates. However, in the meantime, if you have any specific questions, please feel free to contact the recruitment line 01384 215 896. Thank you for your patience and good luck. RTC involving car and bus, Sandpits Road Ludlow at 2.52pm. Very minor injuries to both drivers checked and discharged at scene. New ‘Dementia Friends’ launched by health organisations and Alzheimer’s Society. 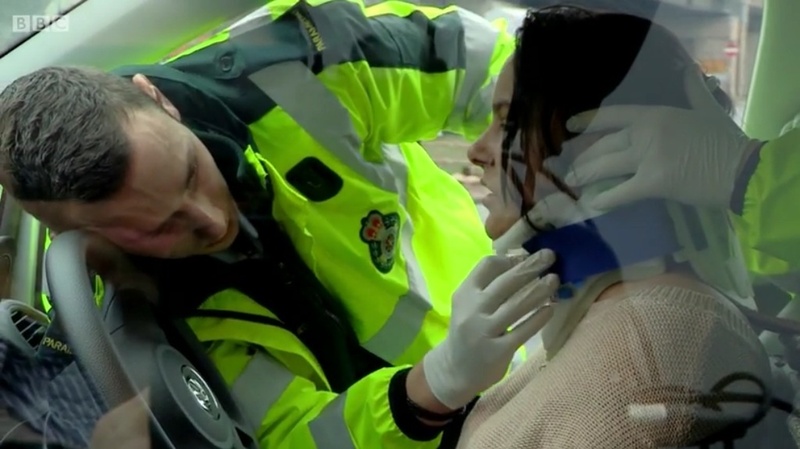 In today’s episode of ‘First Time on the Frontline’ we see rookie paramedic Ben treating a 32 year old man who has been vomiting blood and has chest pains, before moving on to treat 85 year of Jenny. Her heart is running at over 160 beats per minute, almost twice as fast as it should be. 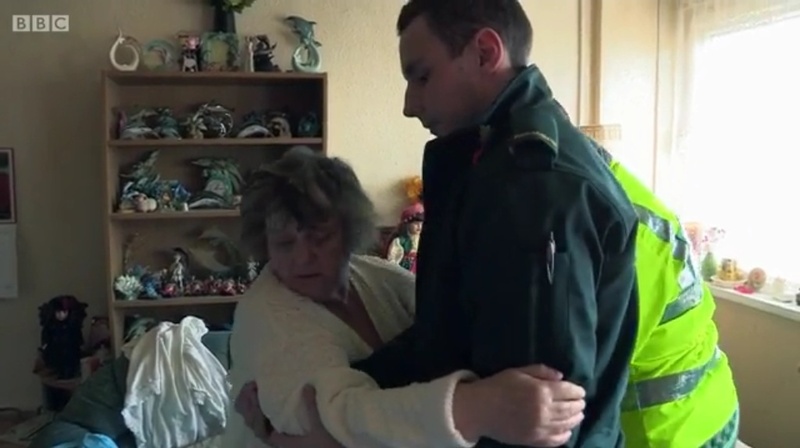 Been missing your daily ‘fix’ of #FirstTimeOnTheFrontline – don’t worry, it’s back on Monday at 11.30am on BBC 1. This episode stars Ben. Sunday 11th May 2014 – 8.45am – John Hawker. 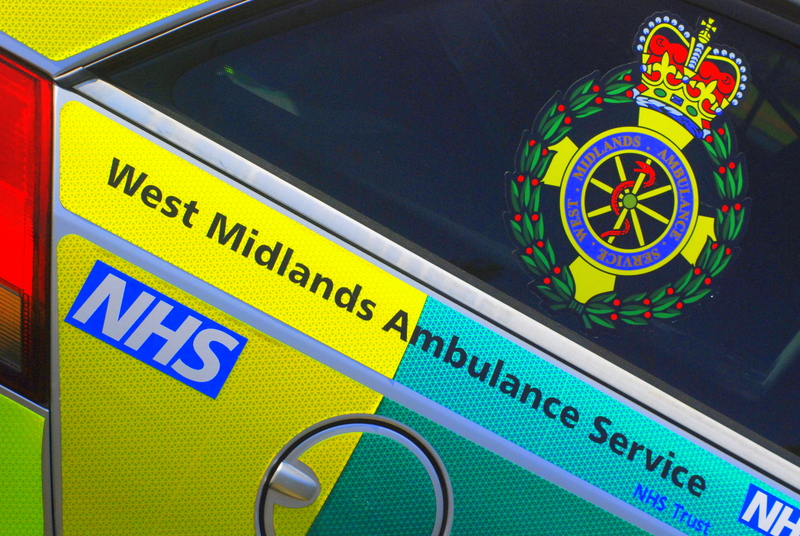 A man has been seriously injured following an RTC in Coventry early this morning. The crash occurred on Hall Green Road, Coventry just before 5.30am. Two ambulances and a paramedic officer attended the scene. A West Midlands Ambulance Service spokesman said: “Crews arrived to find a car that had left the road and been in a significant collision will a bus stop and some railings. 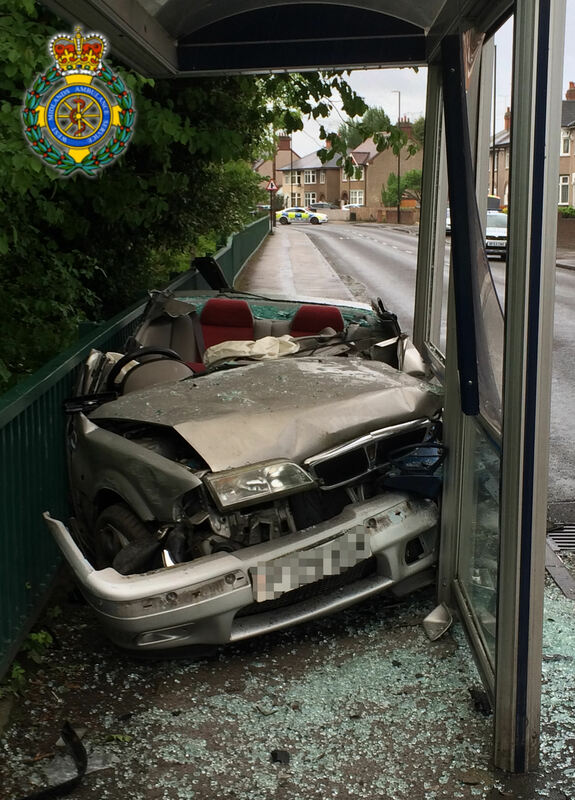 “A man who was travelling in the car was trapped in the vehicle and received emergency treatment before being released with the assistance of the fire service. “The man, believed to be in his 30’s, was treated for serious leg, neck, back and chest injuries. “The man’s condition was stabilised and he was then transferred to University Hospital Coventry and Warwickshire Major Trauma Unit for further emergency treatment. 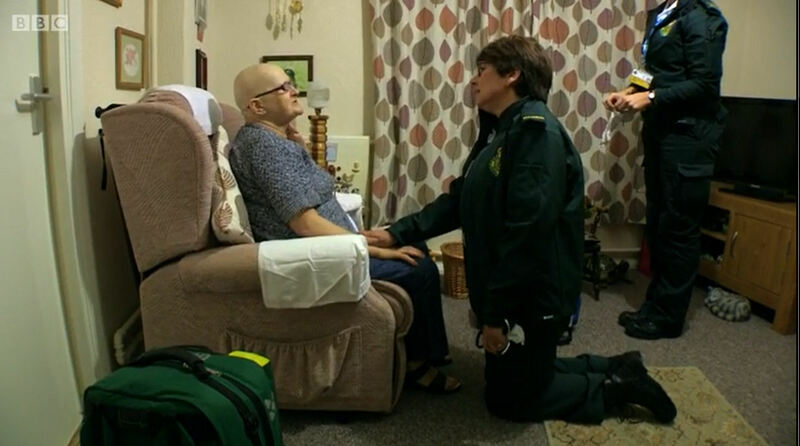 If you use the pictures please credit West Midlands Ambulance Service or @officialwmas. Saturday 10th May 2014 – 10.45pm – John Hawker. 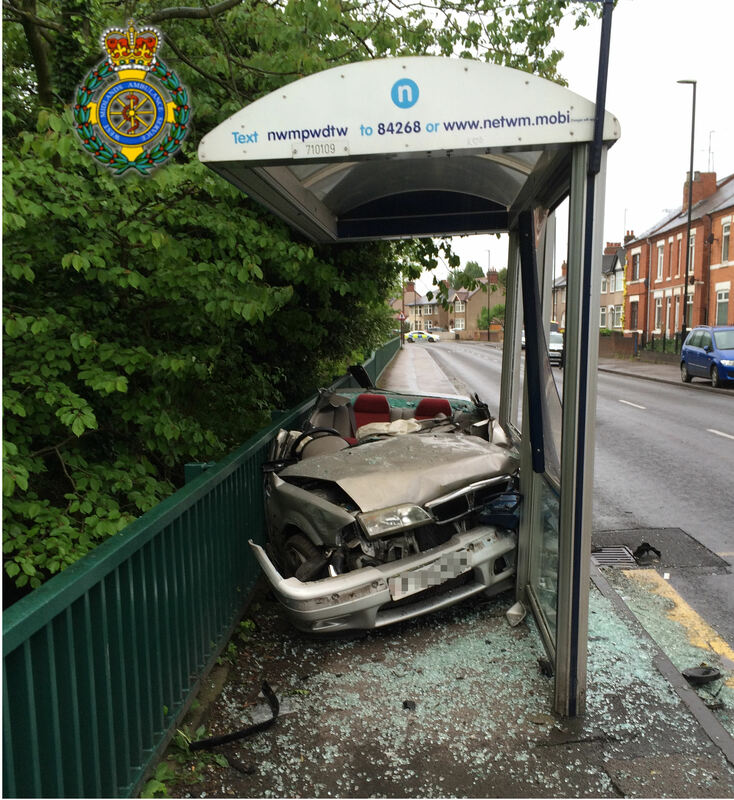 A man and woman in a car, and a family in a house have been lucky to escape serious injury following a crash in Coventry this evening. 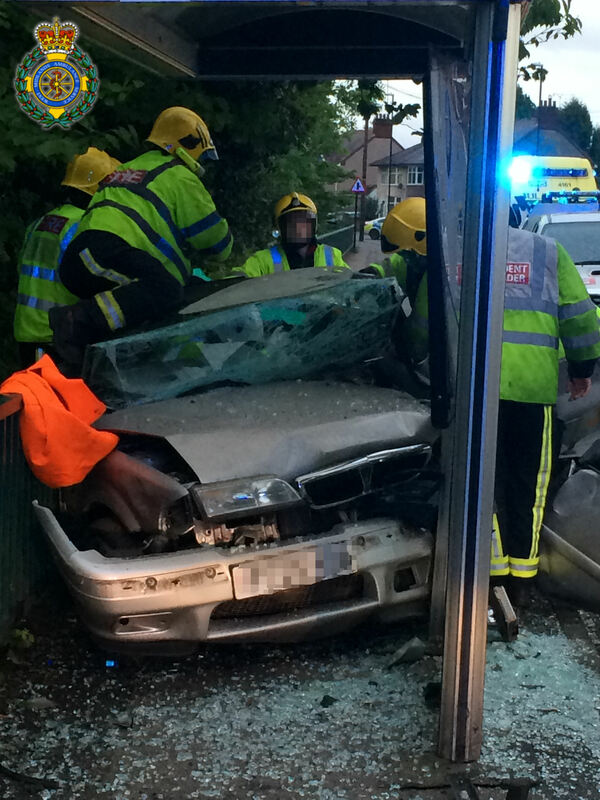 The crash occurred on Earlsdon Avenue South at around 6.45pm. Two rapid response vehicles, an ambulance and a paramedic officer attended the scene. A West Midlands Ambulance Service spokesman said: “Crews arrived to find a car that was imbedded three quarters of the way through the hallway area of a house. “The woman passenger in the car, believed to be 41 years old, suffered neck, pelvic and leg injuries and was treated whilst still in the vehicle. She was extricated from the car with the assistance of the fire service and transferred by land ambulance to University Hospital Coventry and Warwickshire for further treatment. “The man driving the car, believed to be in his late 40’s was uninjured in the crash. Saturday 10th May 2014 – 5.50pm – John Hawker. Six people have been injured, four seriously following a two vehicle RTC in Hereford this afternoon. 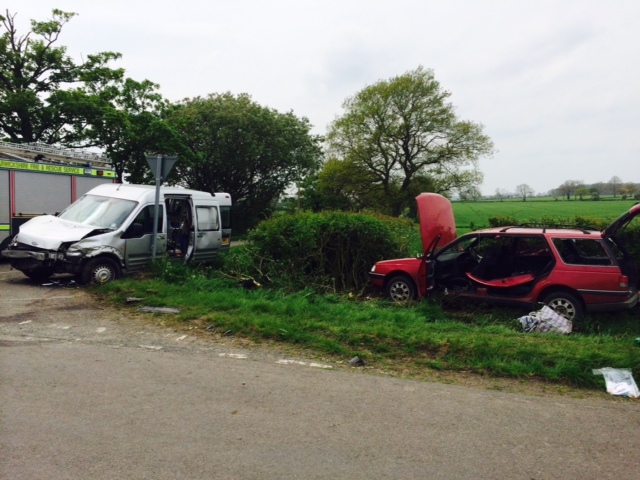 The crash occurred at the junction of Cholstrey Road and Monkland Road, Barons Cross, Leominster at around 1.35pm. Three ambulances, two rapid response vehicles, a BASICS Doctor, two Midlands Air Ambulance’s, the Welsh Air Ambulance and the Warwickshire and Northamptonshire Air ambulance attended the scene. A West Midlands Ambulance Service spokesman said: “Crews arrived to find a car and a 4×4 vehicle that had been in a serious collision. “Two children who were travelling in the back of the car suffered serious injuries. 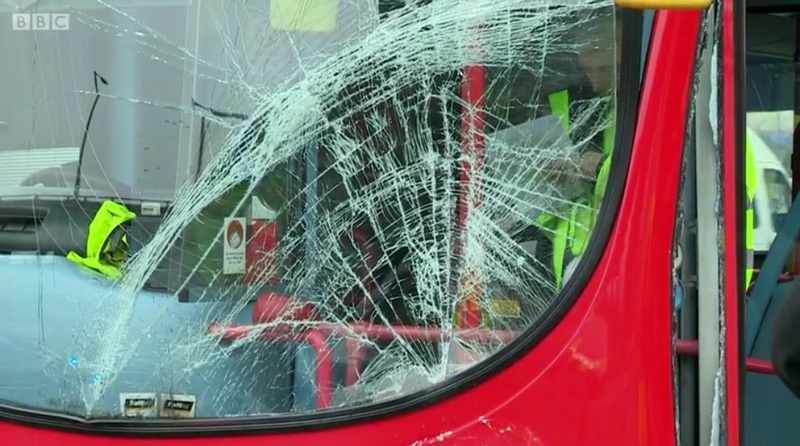 A boy believed to be six years old, and a girl believed to be one year old, both received emergency treatment at the scene for serious head, pelvic and abdominal injuries. Both were air lifted to Birmingham Children’s Hospital in separate air ambulances, where trauma teams were on standby. “A woman believed to be in her 20’s, who was also travelling in the back of the car, suffered serious head injuries and received emergency treatment at the scene. She was airlifted to Queen Elizabeth Hospital Major Trauma Unit for further treatment. “The front seat passenger in the car, a man believed to be in his 60’s, received emergency treatment for serious chest injuries. The man was also airlifted to the same hospital for further treatment. “The hospital had been pre-alerted to the arrival of the two seriously injured patients. “The driver of the car, a man believed to be in his 30’s, suffered chest injuries. Following treatment at the scene the man was taken by land ambulance to Hereford County Hospital for further treatment. “The driver of the 4×4 vehicle, a man believed to be in his 30’s, also suffered chest injuries and was treated at the scene. He was transferred by land ambulance to Hereford county Hospital for further treatment. “The severity of the crash meant a high number of ambulance resources and staff were at the scene caring for patients, including four air ambulances. All emergency service staff worked seamlessly together to ensure all patients received the best treatment as soon as possible. Saturday 10th May 2014 – 11.20am – John Hawker. Staffordshire Police and West Midlands Ambulance Service are urging drug users across the area to take extra care following three separate incidents in the last 24 hours involving suspected heroin users. It is believed that all three incidents occurred shortly after the users took drugs suspected of being heroin and a 37-year-old woman has died and two males in their 30’s are in hospital in an improving condition. The first report was received at around 1.30pm on Friday (9 May) when paramedics attended an address in Leacroft Road, Meir, Stoke-on-Trent to a report of a collapsed 37-year-old woman at the address who had recently taken drugs. The woman was treated and taken to the University Hospital of North Staffordshire where she later died. 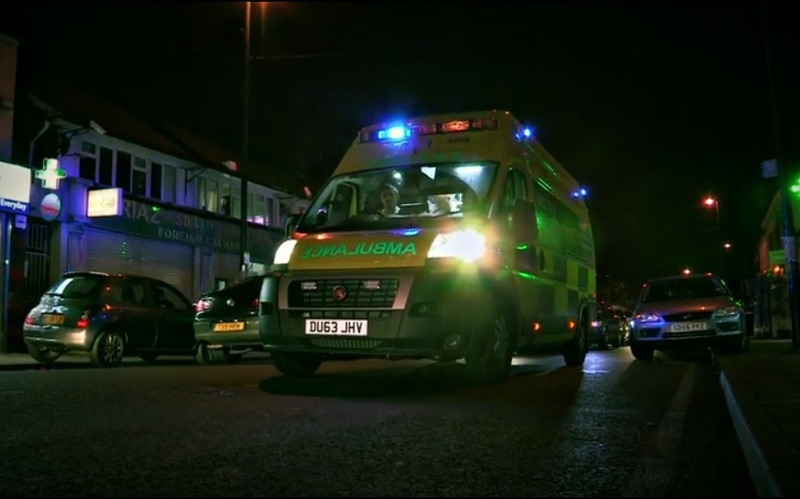 A second incident was reported at just before midnight on Friday when paramedics gave emergency treatment following reports of a collapsed male in Ubberley Road, Bentilee and the third shortly after midnight in Parliament Row in Hanley where a male had also collapsed. Both men were taken to hospital where they remain in an improving condition after receiving emergency treatment for drug use. Detective Inspector Dan Ison from Staffordshire Police said: “Whilst the cause of death will still need to be established our investigations lead us to believe that the woman had used heroin shortly before collapsing. Similarly there is a strong indication that drug use was a factor for both the incidents where the men were found in the street needing urgent medical treatment. 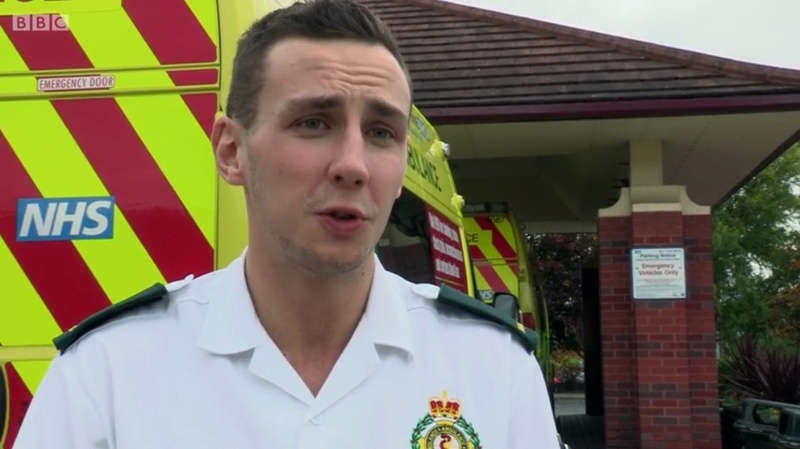 West Midlands Ambulance Service Duty Manager, Lee Carter, said: “Drug users are urged to take extra care following these incidents. Symptoms to look out for are the drug takers breathing becoming very erratic and then slowing down to a point where they stop breathing completely. 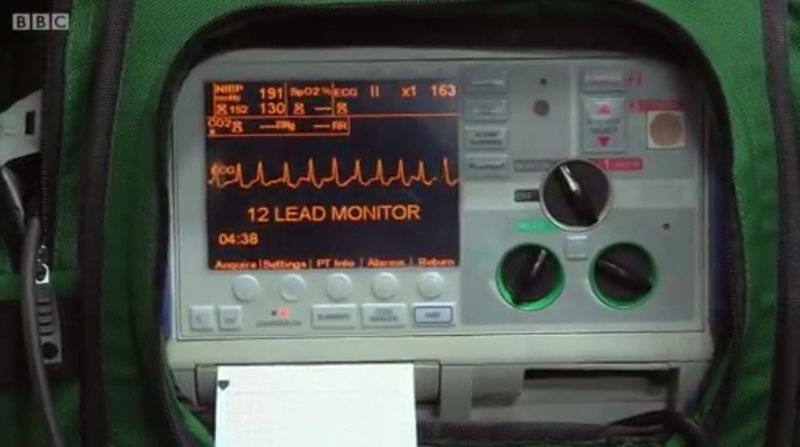 The person then goes into cardiac arrest where their heart stops beating. Anyone witnessing this should immediately call 999 for medical help and follow the instructions given them by the ambulance call assessor, including how to carry out CPR. Officers and ambulance crews across North Staffordshire and Stoke-on-Trent have been alerted about the potential for further incidents to be reported and drug users are being urged to seek support from drug advice lines. We have no further details on the incidents reported. Friday 9th May 2014 – 10.45pm – John Hawker. A man has died following an RTC in Stoke on Trent this afternoon. The crash occurred on City Road, Fenton at around 5.15pm. A rapid response vehicle, an ambulance, a paramedic officer and a BASICS Doctor attended the scene. A West Midlands Ambulance Service spokesman said: “Crews arrived to find a cyclist and a lorry that had been in a collision. “Unfortunately, it quickly became apparent nothing could be done to save the man riding the bicycle and he was confirmed dead at the scene. We have no further details on this incident. This is now a police matter. Friday 9th May 2014 – 10.30pm – John Hawker. A man has died following an RTC near Upper Ludstone this afternoon. The crash occurred on the B4176, near The Woodman, Upper Ludstone, Wolverhampton at around 4.10pm. A rapid response vehicle, an ambulance and a paramedic officer attended the scene. 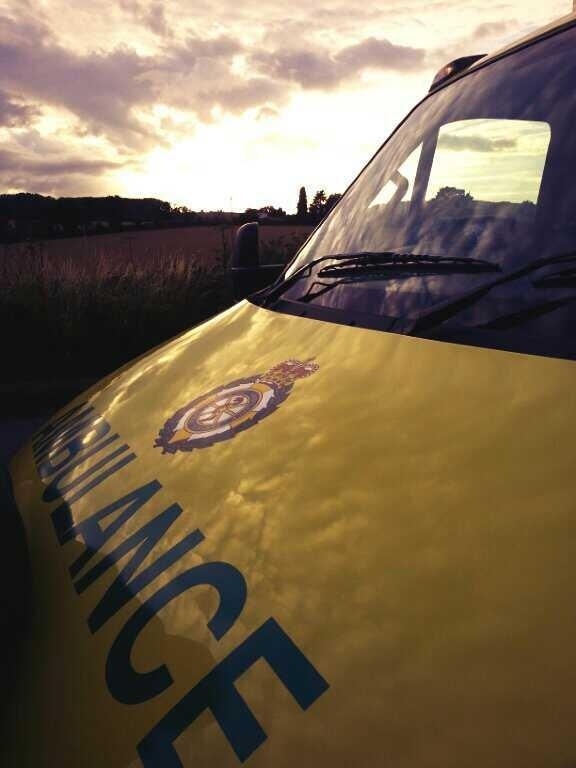 A West Midlands Ambulance Service spokesman said: “Crews arrived to find a car upside down in a field. Friday 9th May 2014 – 4.00pm – Suzie Fothergill. A pedestrian has been treated by ambulance crews today following a road traffic collision in Coventry. 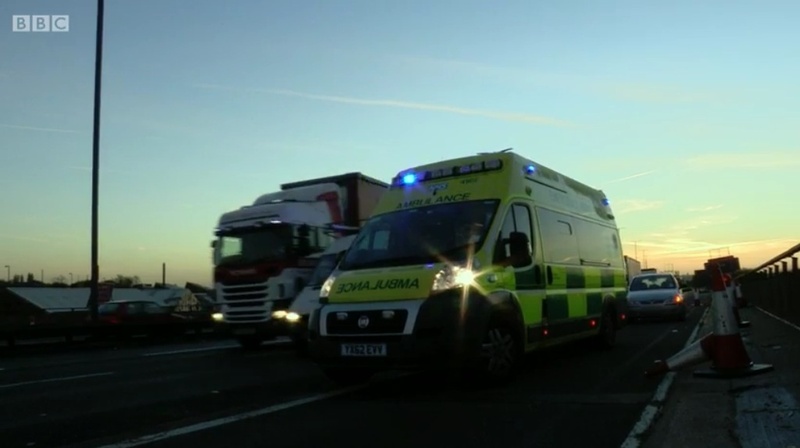 West Midlands Ambulance Service was called to the junction of the A444 and the A4082 shortly before 7.20am this morning. A West Midlands Ambulance Service spokeswoman said: “On arrival at the scene, crews found a car and a pedestrian that had been in collision. “The pedestrian, a woman believed to be in her 60’s, was treated at the scene for a fractured arm and a significant ankle injury. The woman was fully immobilised and conveyed the University Hospital of Coventry and Warwickshire for further assessment and treatment. Friday 9th May 2014 – 1.30pm – Chris Kowalik. 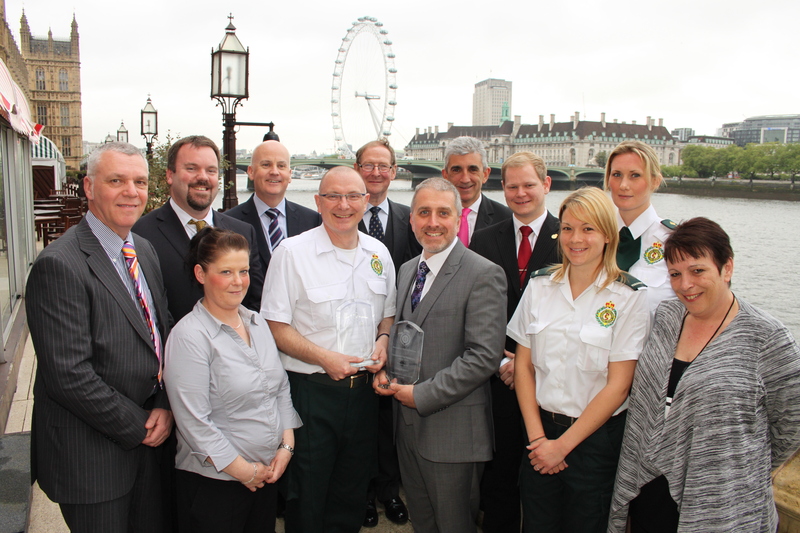 West Midlands Ambulance Service has picked up three awards at a prestigious ceremony at the House of Lords. 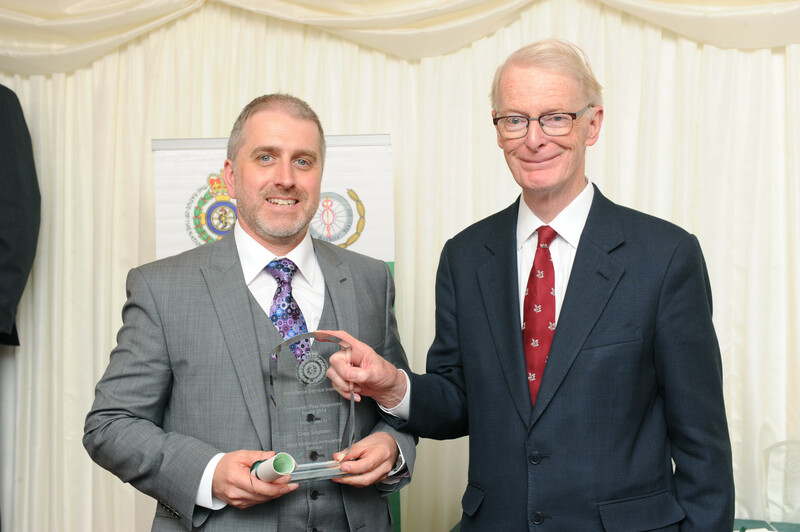 Craig was nominated concerning an incident in Gnosall involving an 18 month-old child who had been attacked at home by the family dog – a Staffordshire Bull Terrier. The dog had suddenly attacked the child and torn the right side of his face. Craig, as the local CFR, was first on scene and commenced treating the child with oxygen before the ambulance arrived. Craig continued to assist the crew then left the scene and the patient in the safe hands of the ambulance crew. The crew were impressed by Craig’s actions and his assistance at what was a very difficult situation and asked for him to be nominated for an award for his calm and swift actions. 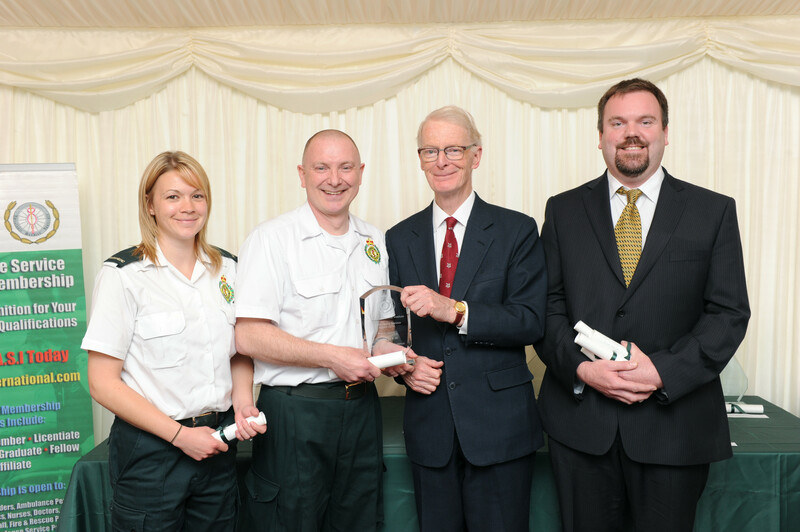 Patient Transport Service Award – Alex Leston and Louise Orsmby. 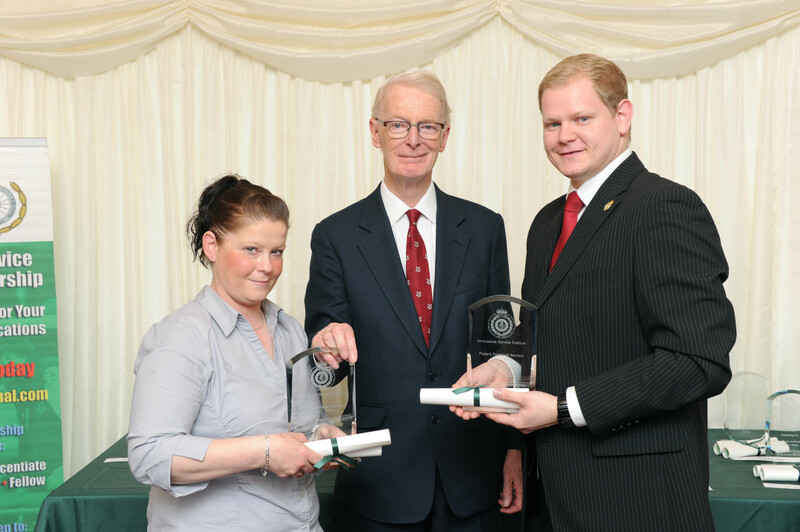 Alex and Louise are a PTS crew working from University Hospital Birmingham who came across a road traffic collision involving a female pedestrian and a large goods vehicle in Moseley in November 2013. 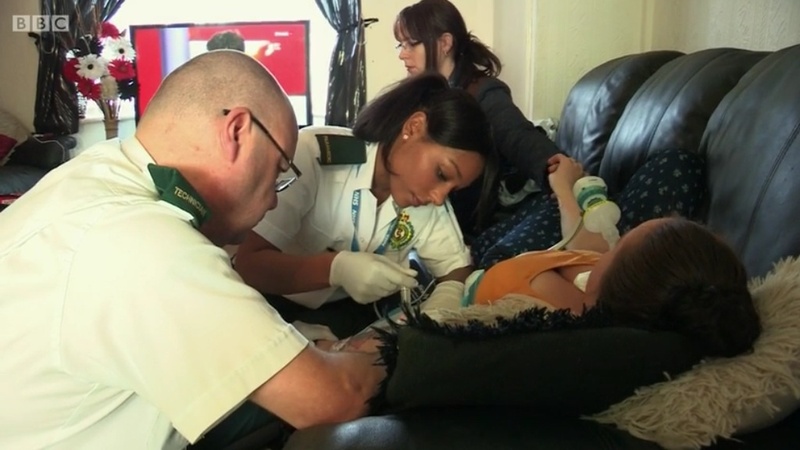 Despite the horrific nature of the patient’s injuries, the crew remained calm and professional in rendering aid until a frontline ambulance arrived and then continued to provide first-class assistance to the attending more senior clinicians. The fronline crew on scene commented on how helpful and calm the PTS crew were and asked to pass on their thanks and congratulations. Midlands Air Ambulance Services (HMED03 Cosford and HMED09 Staffordshire) – James Benson, Ian Walley, Kat Ellis, Fay Mason, Dr. David Balthazar, Sheelagh Withers and Katie Howse. Bond Aviation – Graham Cannell and David Kelly. The case was that of a 33 year-old male worker trapped in a tunnel (3ft wide x 3ft high x 20ft long) under a large (50ft x 20ft) potato sorting maching. His arm had been pulled up over and back down between ten-inch diameter metal rollers. He was stuck in a squatting position in this tunnel. He was bleeding from his axilla (underarm) while trapped. Initially the HMED09 was dispatched. After their initial assessment of the patient they requested back-up from HMED03. Ian Walley from HMED09 crawled into the tunnel and used pressure to stop the bleeding throughout the entire incident. 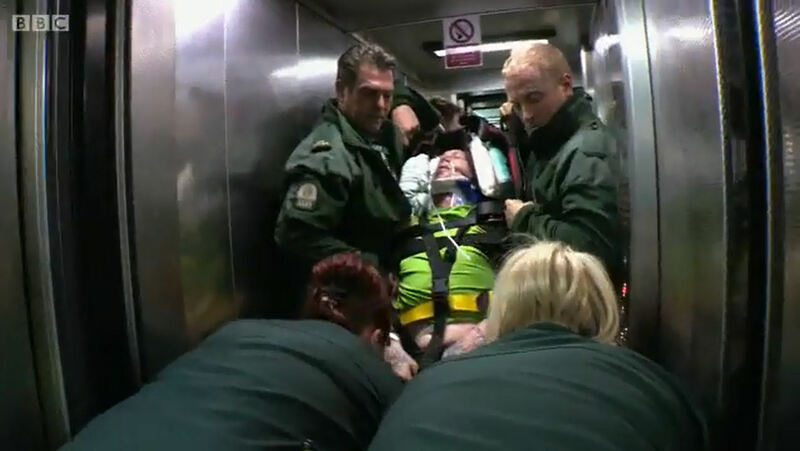 Other members of the ambulance service took turns in the tunnel to treat and reassure the patient. It took two-and-a-half hours to release him. Whilst trapped, the patient had oxygen, morphine, intravenous fluids and two units of O-negative blood. We arranged for the blood to be provided by the University Hospital of North Staffordshire (HMED03 flew from the scene to pick this up). This was a difficult and dangerous job demonstrating excellent team work and inter-service working (with Staffordshire and West Midlands Fire Services). Pictured above left-to-right: Ian Roberts (Acting Air Operations Manager of Midlands Air Ambulance), Dr. David Balthazar, Louise Ormsby, Anthony Marsh, Ian Walley, Sir Graham Meldrum (Chairman of West Midlands Ambulance Service), Craig Singleton, Tony Yeaman (Non-Executive Director of West Midlands Ambulance Service), Adam Layland (Senior Contract Manager, Non-emergency Services), Kat Ellis, Victoria Tufail (Community Response Manager for Staffordshire) and Elizabeth Davies, Assistant Area Manager for University Hospital Birmingham Patient Transport Service. Friday 9th May 2014 – 11.50am – Suzie Fothergill. West Midlands Ambulance Service attended a fire at a residential care home in Birmingham today. Three ambulances, a rapid response vehicle, two ambulance officers and the Hazardous Area Response Team (HART) were dispatched to Oak Tree Lane in Bournville shortly before 6.50am this morning. A West Midlands Ambulance Service spokeswoman said: “Crews arrived to find a fire that had been contained in one of the rooms at the property. “One woman, believed to be a worker at the residential home, was treated at the scene for minor smoke inhalation before being conveyed to Queen Elizabeth Hospital for further assessment and treatment. 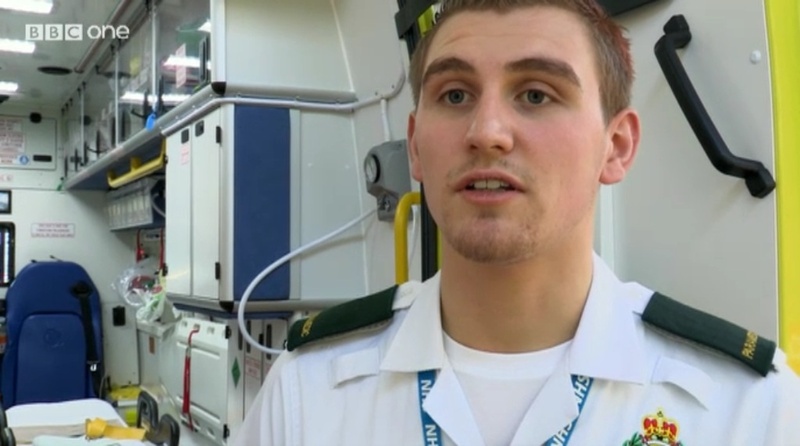 On todays episode of First Time on the Frontline, we see how Sam’s confidence is growing and gets the thumbs up from one of his Clinical Team Mentors. We see him dealing with a 73 year old man who has pneumonia and is in a critical condition. He also gets invited for a cup of tea by a stroke patient who he saw when he was a student. Catherine reckons he’s turned into “a good looking boy”! Despite the jollity, dealing with stroke patients is deadly serious; 1 in 5 strokes ends in death. Wednesday 7th May 2014 – 5pm – Jamie Arrowsmith. A woman suffered multiple injuries and had to be taken to a major trauma centre following a collision with a car on a busy Birmingham road this afternoon (Wednesday). West Midlands Ambulance Service was called to the incident which took place near to the Toby Carvery on Hagley Road West, Quinton, shortly before 1.50pm. A paramedic officer came across the incident and immediately began providing aid whilst waiting for the arrival of an ambulance, an area support officer and a doctor. A West Midlands Ambulance Service spokesman said: “On arrival, crews found a woman, believed to be in her 80s, lying at the side of the road and a car parked nearby that had suffered damage. “Following assessment from ambulance staff, the woman was given pain relief and immobilised with the use of a neck collar and spinal board. 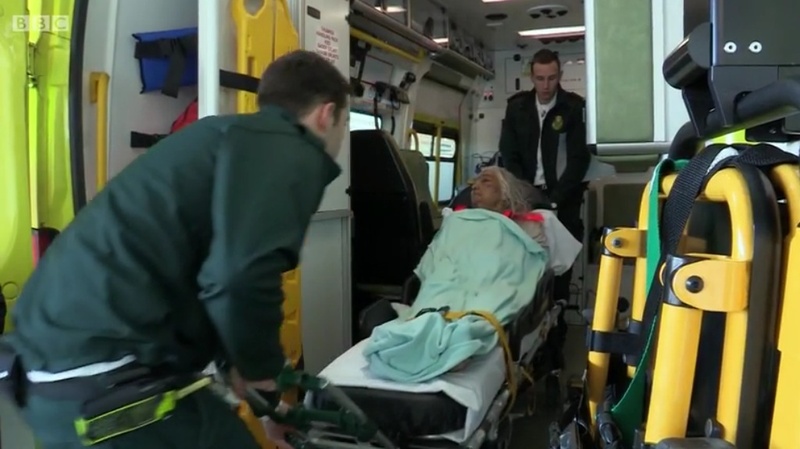 “Once her condition was stabilised she was treated for head, shoulder, back and ankle injuries before being taken to the Queen Elizabeth Hospital Birmingham. “The doctor travelled with the patient to hospital, continuing to administer treatment en-route. “The driver of the car was thankfully unhurt in the collision but was understandably shaken by the incident. Wednesday 7th May 2014 – 10.30am – Jamie Arrowsmith. 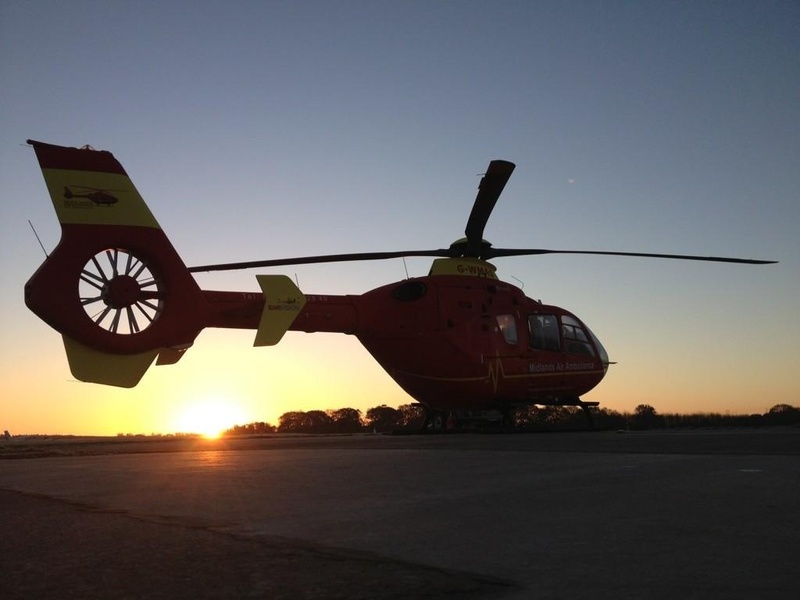 A motorcyclist has been anaesthetised and airlifted to a major trauma centre following a collision with a car in Bromsgrove this morning (Wednesday). West Midlands Ambulance Service was called to Fockbury Road in Dodford shortly after 7.35am. A non-emergency Patient Transport Service vehicle came across the incident. The crew provided aid until the arrival of two ambulances, a paramedic area support officer, a doctor and the Midlands Air Ambulance from Cosford which carries a specialist trauma doctor. A West Midlands Ambulance Service spokesman said: “On arrival, crews discovered a motorbike that had been in collision with a car. “The rider, a man believed to be in his 40s, was found some distance from the bike. He had suffered serious head injuries and as a result the doctor from the air ambulance anaesthetised him at the scene. “After stabilising his condition, he was airlifted to the major trauma centre at the Queen Elizabeth Hospital Birmingham. “There were three people travelling in the car, a father and two young daughters, thankfully none of them were hurt but were understandably shaken by the crash. 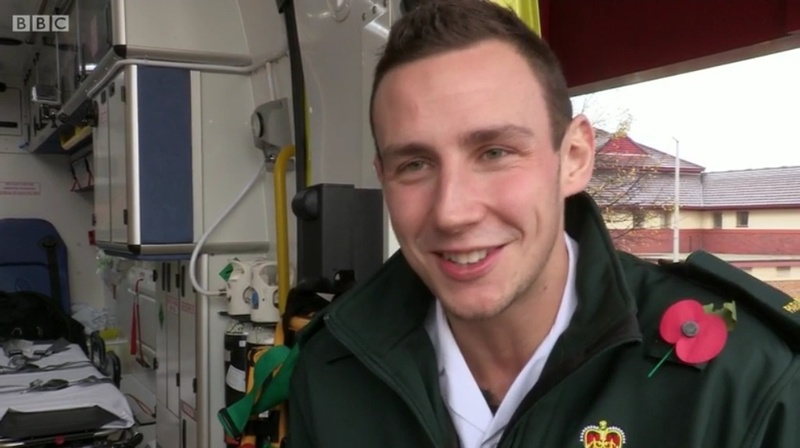 On Wednesday, you can meet Mark, another of our rookie paramedics as he cares for a multiple sclerosis patient. 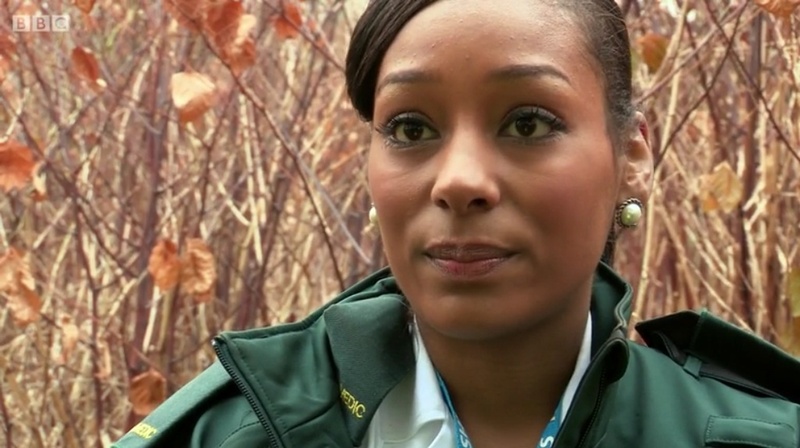 Don’t miss #FirstTimeOnTheFrontline at 11.30am on BBC 1. Tuesday 6th May 2014 – 5.20pm – Claire Brown. A team of paramedics who left John O’Groats on Saturday are already half way through their epic charity cycle ride to Lands End. Hazardous Area Response Team (HART) paramedic Dave Bentley and Wolverhampton Paramedic Neil Weaver together with a support crew of HART paramedics Neil Baars and Olly Ayles, are hoping to complete the 850-mile journey on two wheels in just seven days. They hope their efforts raise as much money as possible for Pilgrim Bandits, a charity which supports injured armed forces members. The journey so far hasn’t been without incident as, on day two, Neil came off his bike on the A9 in Scotland after a very long uphill climb. 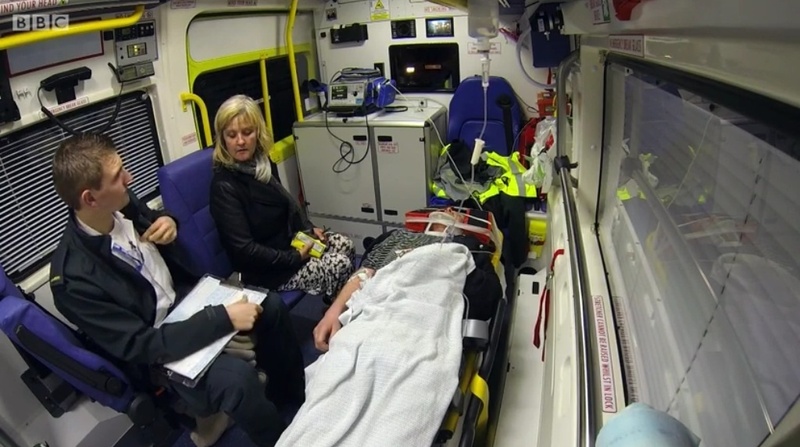 Neil was knocked unconscious for a short period and needed medical care from the paramedic support crew and colleagues from the Scottish Ambulance Service. After some rest and recuperation, Neil is back in the saddle. 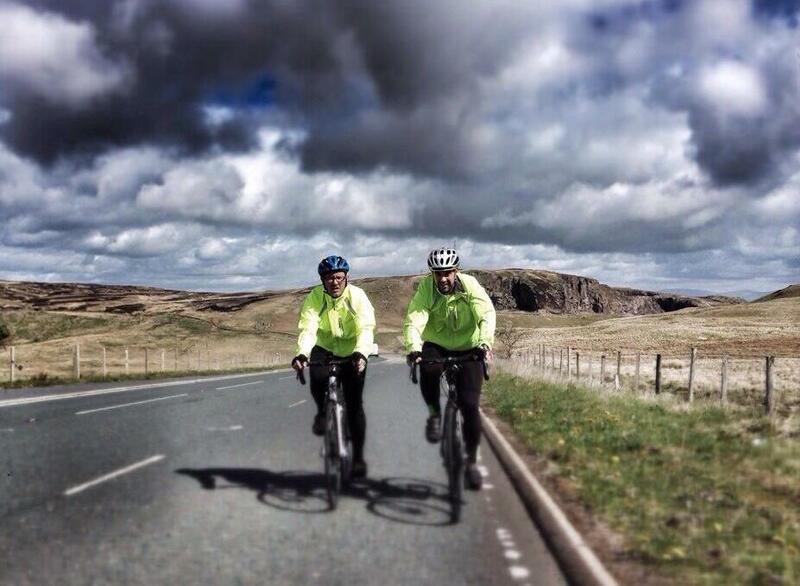 Pictured is Dave Bentley (front) and Neil Weaver (back) crossing the half way mark of their 850-mile cycle to Lands End. 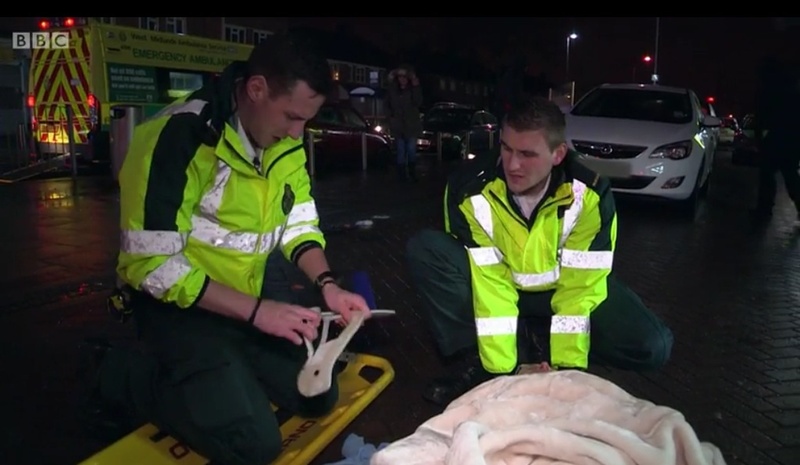 In today’s episode, you can see rookie paramedic Ben dealing with Habib who has suffered a nasty cut to his hand from a chainsaw. He has to take a decision on the best hospital to take him to. 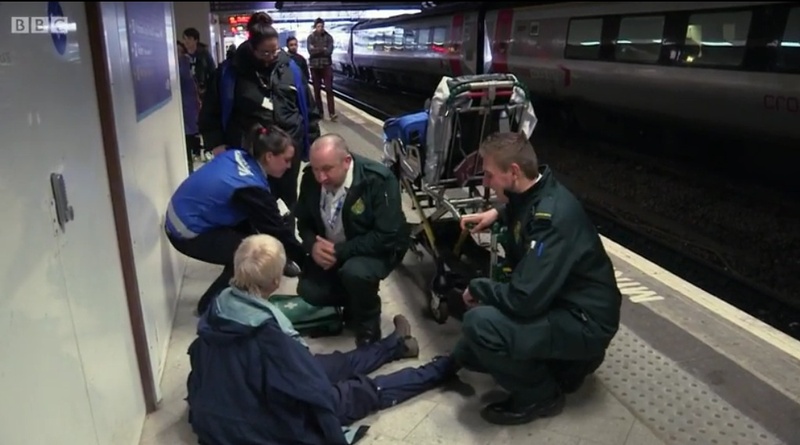 You can also see him treating Carol who fell on the platform of New Street Station. 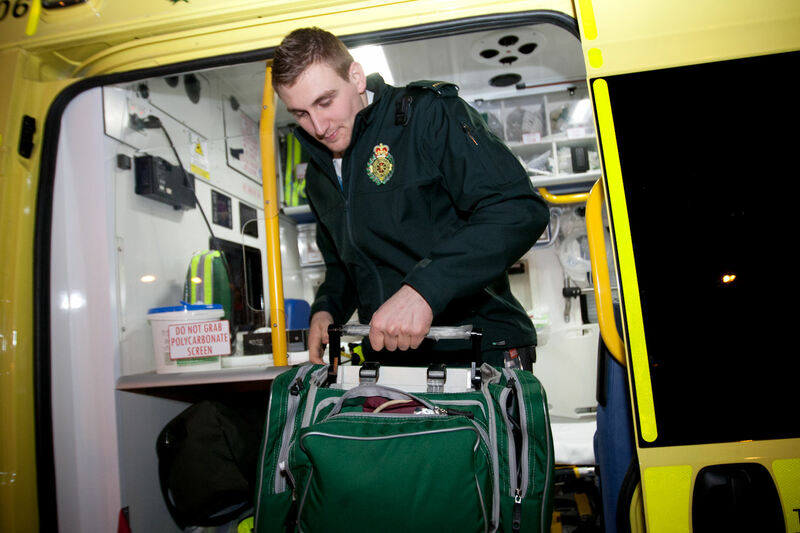 You can see how important it is that rookie paramedic Sam knows how to carry out the FAST test – Face, Arms, Speech, Time to call 999. You’ll also see Sam dealing with Louis who suffers a severe allergic reaction. Make sure you catch up with the next episode – Monday to Friday at 11.30am on BBC 1. Monday 5th May 2014 – 7.00pm – Claire Brown. Ambulance staff said a motorcyclist who wasn’t wearing protective leathers was a “lucky boy” after escaping more serious injuries in Worcestershire this afternoon. West Midlands Ambulance Service was called to the junction of Cooks Hill and the B4084 in Wick, Pershore at 2.10pm (Monday). An ambulance, a senior paramedic manager and the Midlands Air Ambulance from Strensham attended the scene. A West Midlands Ambulance Service spokeswoman said: “A car and a motorcycle had been in collision. The 18 year old biker, who wasn’t wearing leathers, had come to rest in a hedge 50 metres further down the road from where the collision happened. “Ambulance staff assessed the motorcyclist and found he had sustained a broken ankle, a suspected fracture to his lower leg and gravel rash to his back. The man was given pain relief before being immobilised with a neck collar, spinal board and pelvic binder as a precaution before being airlifted to Queen Elizabeth Hospital Birmingham, a major trauma centre, for further assessment and treatment. Monday 5th May 2014 – 6.30pm – Claire Brown. A man has been airlifted to hospital with a broken leg after falling five feet from a wooden ladder in Malvern today. West Midlands Ambulance Service was called to a property in Mathon at around 12.15pm this afternoon (Monday). A responder paramedic, an ambulance and the Midlands Air Ambulance from Strensham attended the scene. 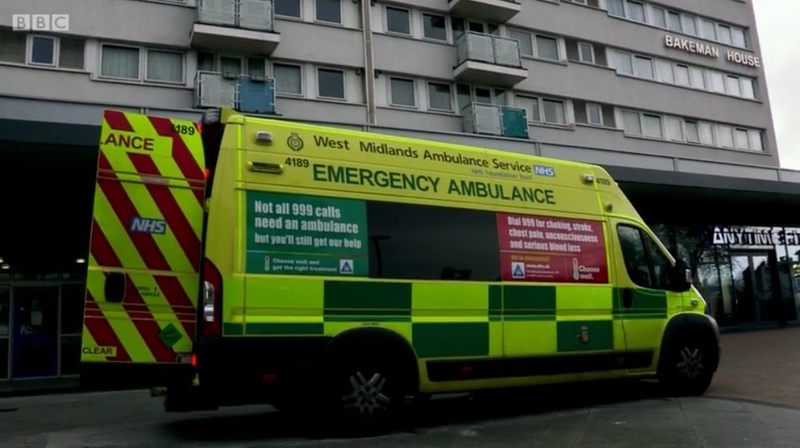 A West Midlands Ambulance Service spokeswoman said: “The 46 year old man was up a wooden ladder doing some maintenance on a property when he fell five feet, trapping his leg between two rungs causing both his leg and ladder to break. Monday 5th May 2014 – 6.15pm – Claire Brown. A man was lucky not to have lost his eye after an angle grinder cut his face this morning in Rugby. The incident happened at a property in Southam Road, Kytes Harwick, shortly before 8.00am (Monday). A community paramedic, an ambulance and the Midlands Air Ambulance from Strensham were sent to the scene. 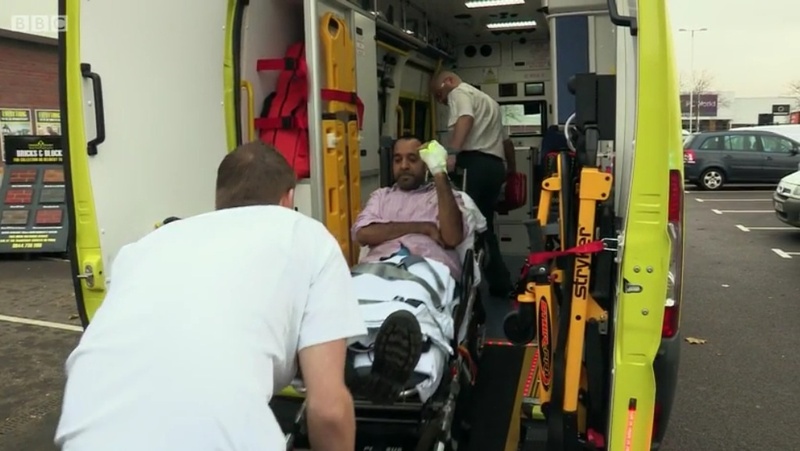 A West Midlands Ambulance Service spokeswoman said: “The 54 year old man had been cutting up wooden logs with the angle grinder when it kicked back and hit him in the face. The man sustained a nasty five inch cut from his eyebrow to his chin which was bleeding heavily. “The swelling was so bad that ambulance staff were unable to see whether the man’s eye had been damaged. They carefully stemmed the bleeding and covered his laceration with moist dressings before he was airlifted to University Hospital Coventry and Warwickshire for emergency maxillofacial treatment. Monday 5th May 2014 – 5.30pm – Claire Brown. A woman and a teenage girl are spending their bank holiday in hospital after a collision involving a car and a van left them with serious injuries in Rugby this afternoon. West Midlands Ambulance Service was called to Collingham Lane in Broadwell just after midday (Monday). An ambulance, a community paramedic, a paramedic area support officer, a BASICS doctor and the Midlands Air Ambulance from Staffordshire attended the scene. A West Midlands Ambulance Service spokeswoman said: “A total of five people and three dogs were involved in the collision. The four occupants of the car were assessed by ambulance staff. The driver, a man in his 50s, sustained a cut to his hand which was cleaned and dressed with bandages by paramedics. He did not require hospital treatment and was discharged from care. “One rear seat passenger, a 17 year old girl, was out of the vehicle but had sustained a nasty facial injury which was bleeding quite heavily. She also sustained pain to her neck and back. The girl was given pain relief before ambulance staff carefully immobilised her onto a spinal board and neck collar. The girl’s injuries were dressed before she was taken by land ambulance to University Hospital Coventry and Warwickshire. “A second rear seat passenger, a woman believed to be 58, sustained a suspected fractured pelvis and a nasty fracture to her lower leg. 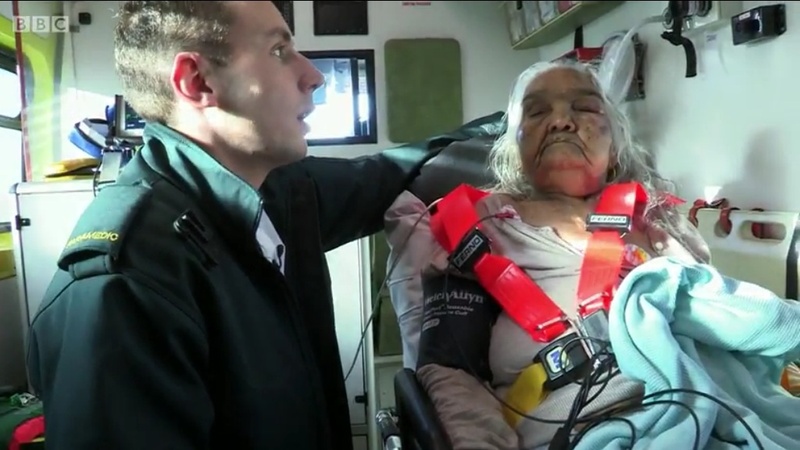 The doctor and paramedics administered pain relief to make her more comfortable before working closely with the fire service to extricate her from the car. 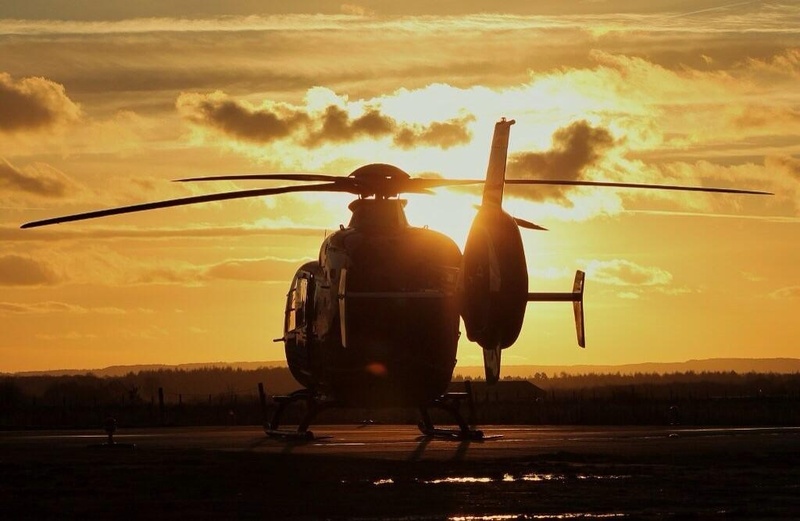 “The woman was immobilised with a neck collar, spinal board and pelvic splint before being carried to the awaiting helicopter, which had landed in a nearby field, and airlifted to University Hospital Coventry and Warwickshire.